Happy weekend! It is Satuday night here. Saturday is always my no-academic and no-experiment day. I always spend it together with my bf (since he always work on Sunday, and I will do experiment also on Sunday). A typical day off for two PhD students will be generally simple! 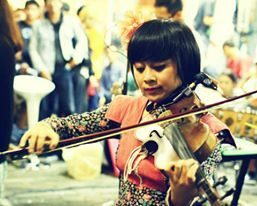 We will either sing or play violin and he would accompany me record music video. Or, we would be out eating or he would accompany me shopping. So let me tell you one by one. One of the most important thing is outfit of the day. Although we don’t usually go really far but I will dress up, still! Today is really hot so I dress up like this! pink sunnies from Paris van Java, Bandung, Indonesia; basic black tops and kilted mini skirt from Topshop; a shocking pink Harrods bag; and platform Converse shoes. I don’t have my bf ootd. He is just a normal boy, does not care much about fashion. lol. Anyway, today we tried new restaurant and new menu! 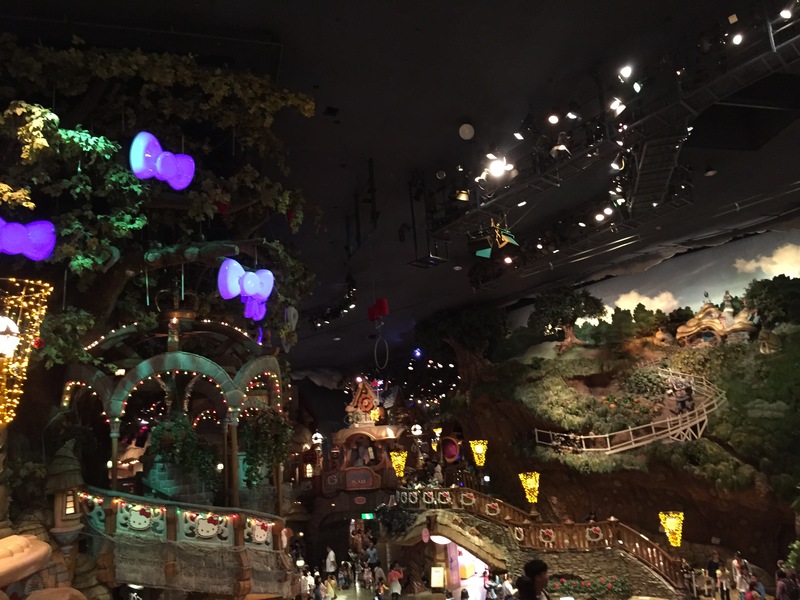 This restaurant is located just around 3 minutes walk from Aobadai Station (walking out from the west exit towards Aobadai Tokyu Square). We always passed this restaurant everytime we go to Jonathan’s Aobadai. Just like the name, the restaurant specialized only on steak. The restaurant is quite small (only 9 seatings in a counter setting). But the food is delicious and fresh! We ordered the lunch set steak that already includes rice, salad, and miso shiru! (1280 JPY for ladies size 120 gr and 1680 JPY for men’s size 140 gr). They served salt, pepper, shoyu sauce, and mustard for seasoning. One interesting thing we learned today that the black round block is actually a heating block. The steak will be served in medium rare, so if you want to make it well done, you can just press and grill your steak on the block! It is definitely not my first time to go to this coffee shop but today I finally tried out the summer menu, kakigori (かき氷 Japanese shaved ice dessert). It comes in two flavor, strawberry and kuromitsu-houjicha (Japanese sugar and tea). Of course, I asked for the strawberry flavor, lol. What can I say about this? It is a perfect combination of finely shaved ice with strawberry sauce and chunked strawberry. It is combined with condensed milk and ice-cream on top! 🙂 Perfect for the hot summer day! Caution, it looks small but actually it is quite big ^^ We had hard time to finish everything :p Next week, I would probably try the other flavor. For those living in Japan, stay hydrated and safe from the scorching heat! The last 6 months have been difficult in many aspects (study, lab-life, human relation, love relation, etc.) and apparently i am in a point where I feel to busy and cannot handle it until I decide to slow down a little bit >.< BUT, at least right now I only have 2 more deadlines : my grant final report and my publication. 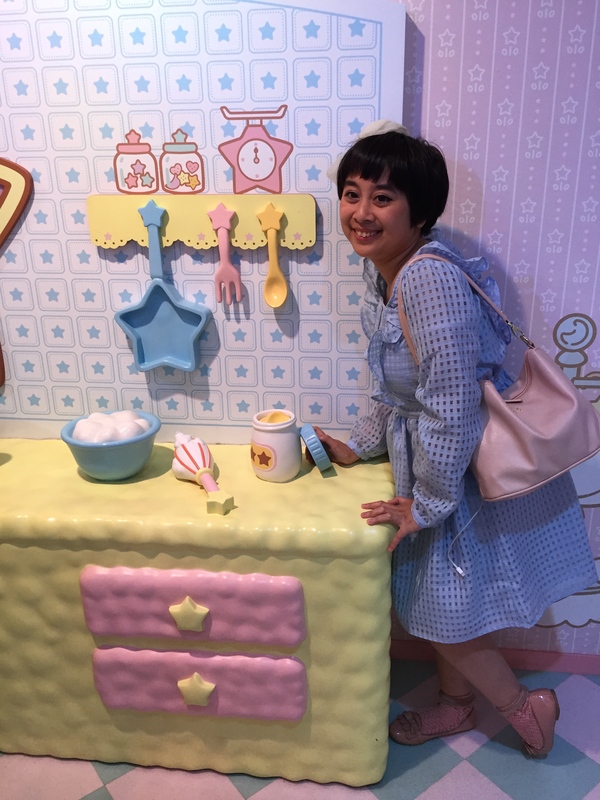 So I am now trying to slow down myself by developing four habits : cooking, singing and playing violin, writing food journal, and… start to write in this blog again regularly. Let’s start with something simple : JANUARY FAVORITE THINGS!! 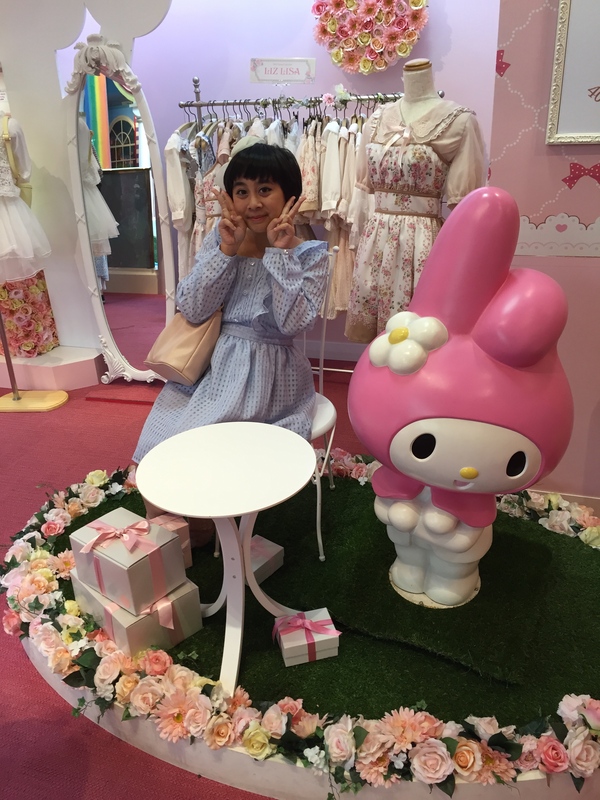 So yes, as you maybe already know, I love kawaii (cute) things and it is such a heaven to live in Japan. 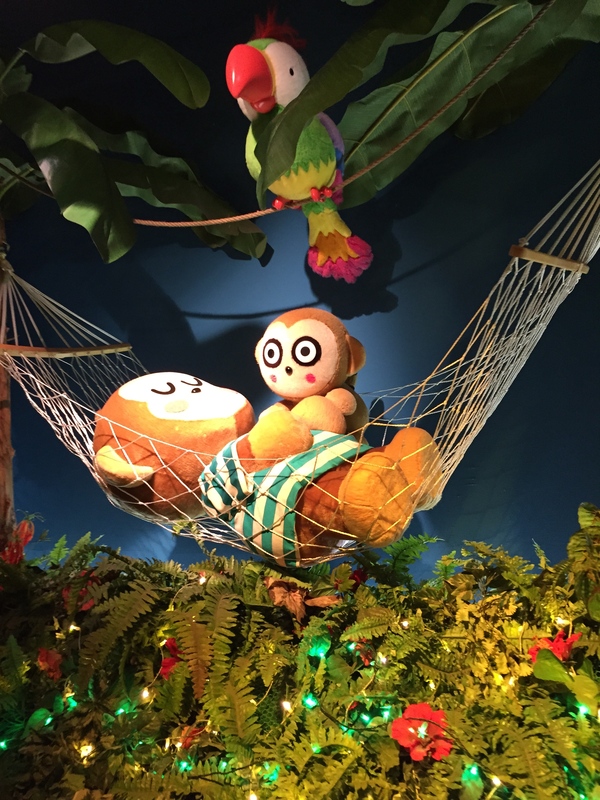 Japan is full of cute things, and these are my favorite things in January! 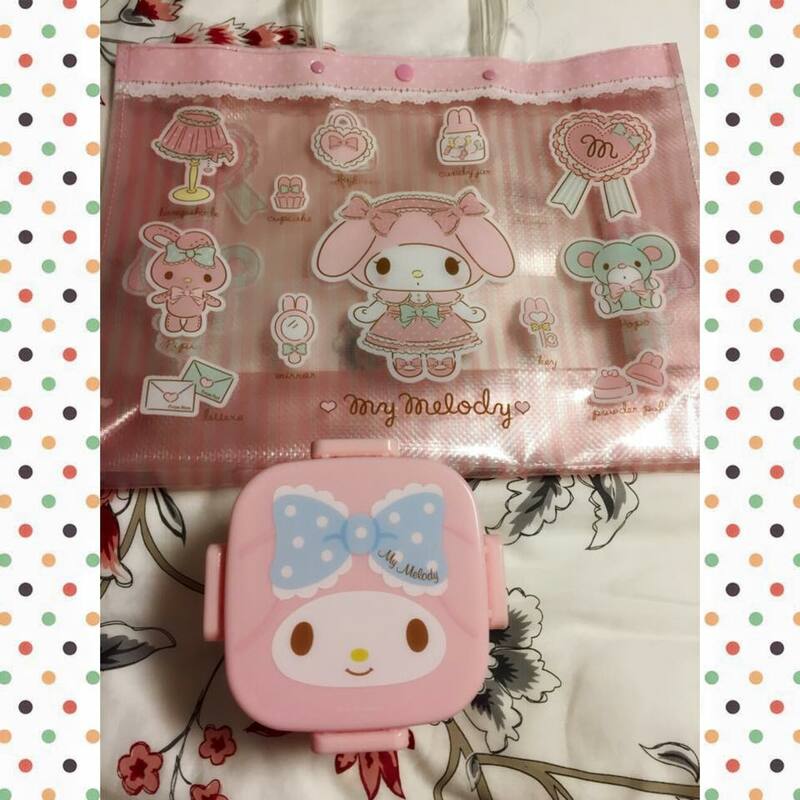 Pink sweets haul from school shop i just love these! They are pink and super delicious! First, ふわふわ Pocky Midi (ストロベリーふローマジュ – Strawberry Fromage) — this is not the ordinary Pocky, Pocky Midi is shorter and a bit fatter (chibi, in my opinion). The taste of this? So delicious! ふわふわ means fluffy and this pocky tastes like fluffy strawberry cheesecake! 🍰 Chupa Chups ストロベリークリーム- Strawberry Cream delightful old-fashioned lollipop! 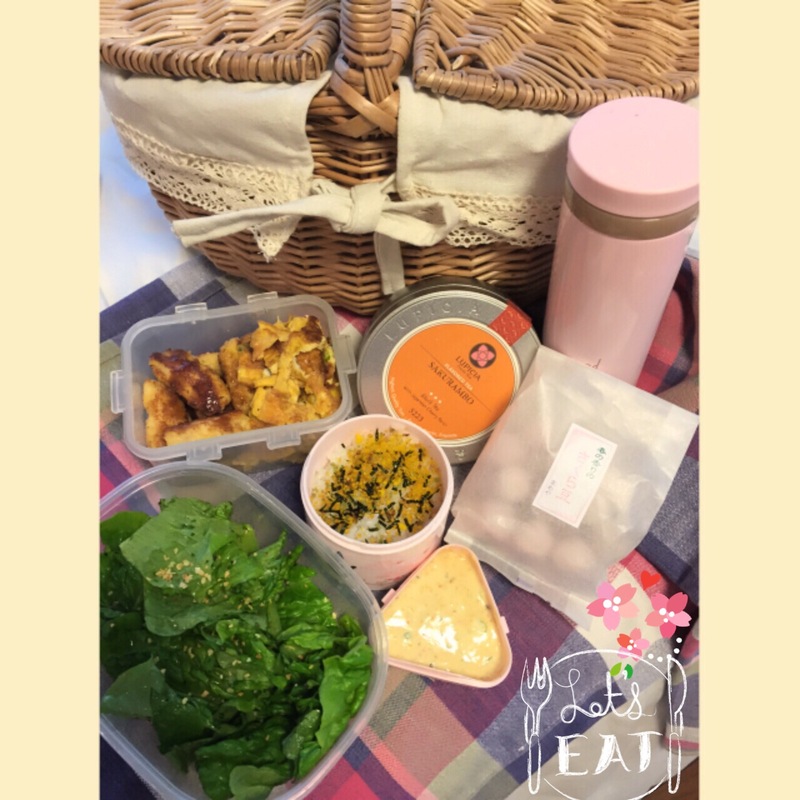 Tropicana Essentials 食物繊維 Peach Blend 食物繊維 means dietary fiber and this juice is really delicious! This is my favorite juice this month. This month i bought a unicorn-motif case from Rakuten altogether with the unicorn mobile battery. I’m feeling pretty much like in a fairy-tale land. This nail polish comes from my favorite shop, Its Demo, located dangerously outside my train station (lol). I am already longing for this nail polish for long time because it’s sailor moon special series, for God’s sake! It’s purple, glossy, and glittery. As an addition to my nail polish, I also bought a nail oil stick. It is like a lipbalm for your nail and it will keep your nail moisturized especially during this cold and dry winter. And… above is my masterpiece by using this nailpolish!! Combining it with my 100 JPY light purple nail polish from Cando I can make a lame gradation imitation nail, lol. Quite beautiful isn’t it? P.S : this kind of nail art will cost around 3000-4000 JPY in proper nail salon, lol. So these are my January favorite things! 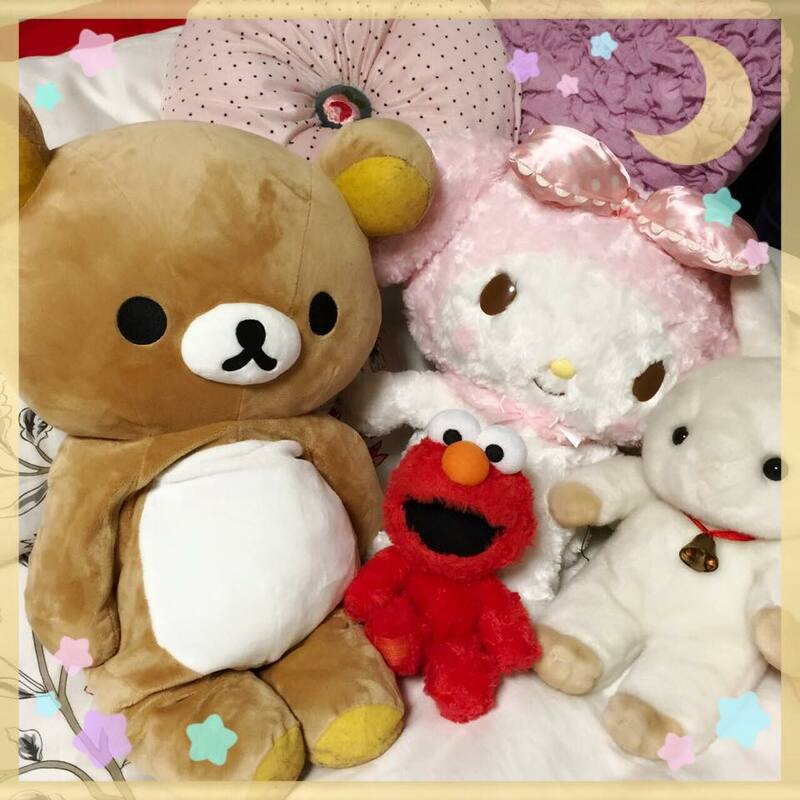 Anyone want to share their favorite things to add up my kawaii Japan things? I was really busy with my research lately, but this week I have a “legal spare time, lol. 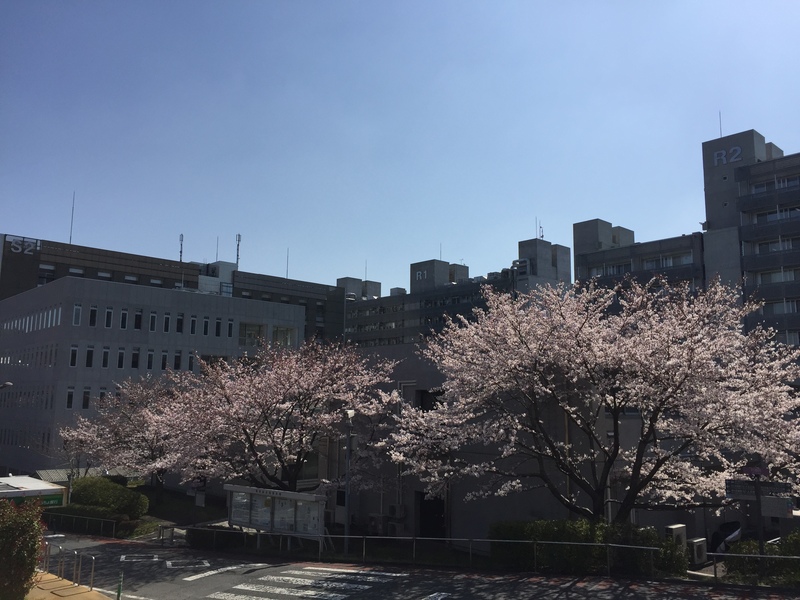 I will attend a the annual meeting of Chemical Society of Japan in Kyoto, and since I have morning presentation I can go the day before. Since conference has not started yet today, so I have the opportunity to stroll around! Because i have visited most of the notable temples in Kyoto. In case you want to try the same experience with me, I will give you explanation in detail! 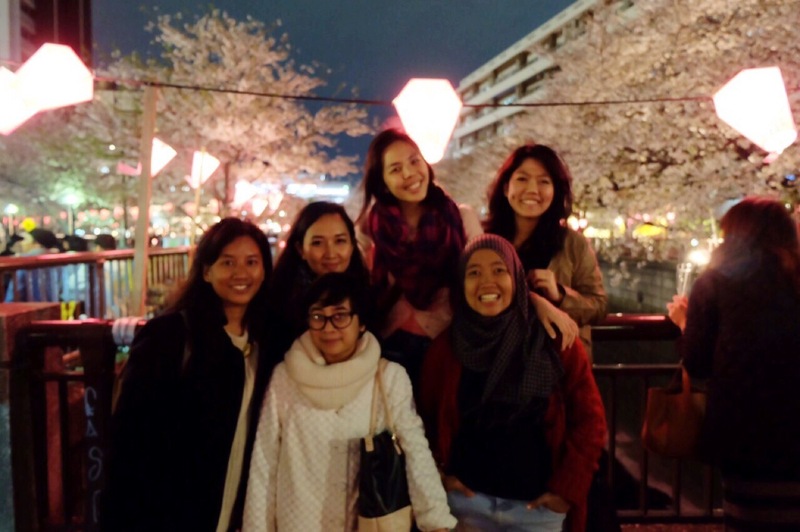 What is Maiko and Why? Maiko is a women that perform dance, sings and traditional instrument for visitors during feast. Maiko is the apprentice geiko and usually aged 15-20 years. Right now in Kyoto, there are many shops that offer Maiko Dressing-up Experience for tourists. So that is why, right now it is very common for normal people to have one day experience dress-up as a Maiko. Okay, so how do you select the right shop? The shop that i chose is Maica. in Gion, Kyoto Basically I just typed “Maiko dress-up in Kyoto” using google and found this shop. The website has quite good English explanation and prices are also reasonable. They have variety of package so that you can choose which one suits your budget the most. Magical inter phone that can transform you into maiko! 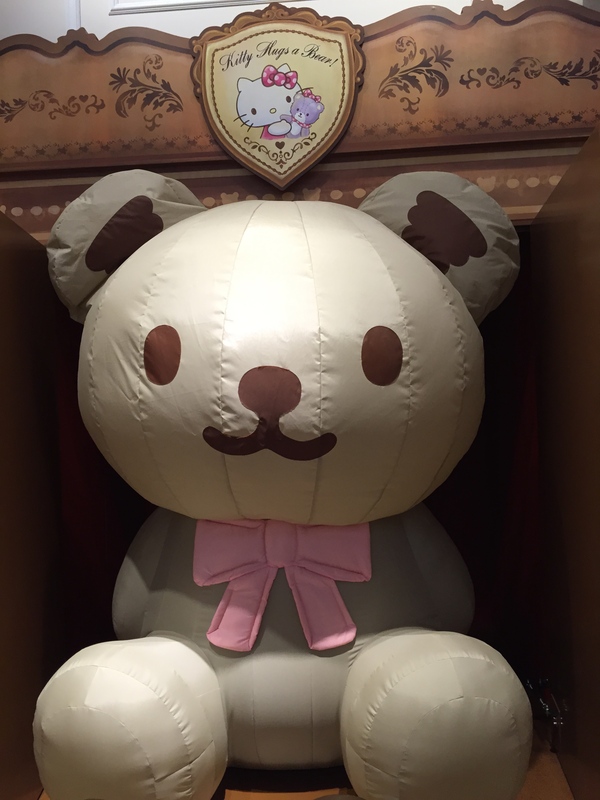 The package that i chose is “Okigaru” Plan, right now on sale for 6500 JPY (excluding tax). This package cover make-up, hair, kimono rental, wig rental (you can only choose whole wig), hair accessories rental, one studio photograph (printed in B5 size), and one hour of free photo time inside the house. Me and my studio photograph! 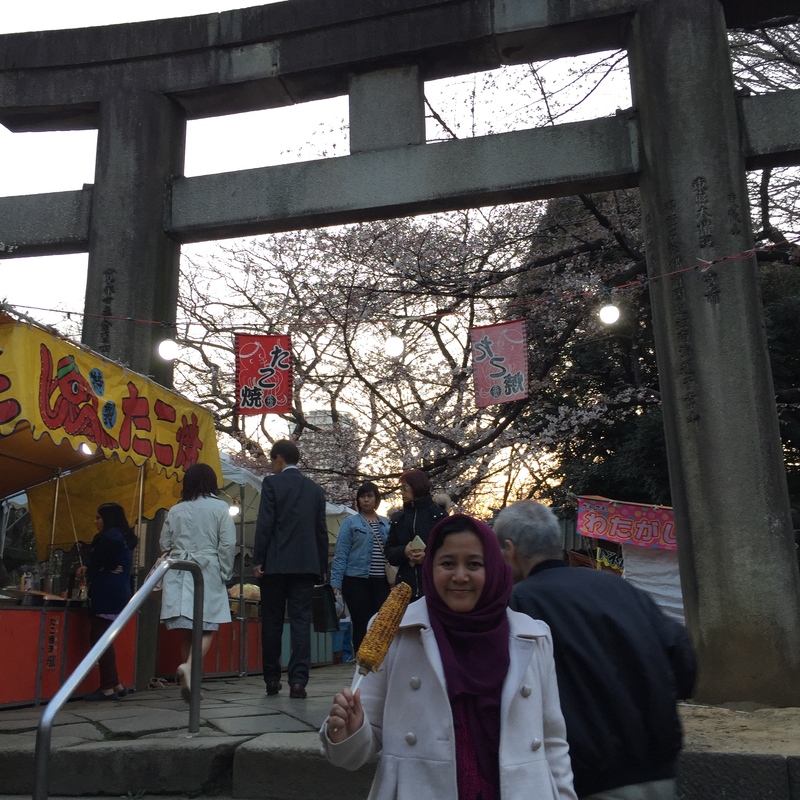 If you want to do longer, they also have package including walking outside (Gion area) or even guided tour to farther temple, but it also comes with higher price. It is actually described well here, but I will just retell you my own version. Tada! Suddenly I transformed into Maiko! And after that, photo time! One studio photograph was taken and if you come alone (like me) the staffs will help us to take picture (Up to 5 pictures). Other than that we can just explore the house by ourselves and selfie stick is allowed. Although it is small, almost every parts of the house are beautiful with classic Japanese decoration. Tea ceremony, one of my most favorite picture! Oh, i forget to mention that you can wear contact-lenses for the make up and also don’t worry about the make-up, it is actually light. You can remove it without ease using any kind of makeup remover you bring, they will also help you to remove the neck makeup. That’s all for today’s post! I hope that i will have successful presentation tomorrow! ❤ enjoy Spring break, everyone! 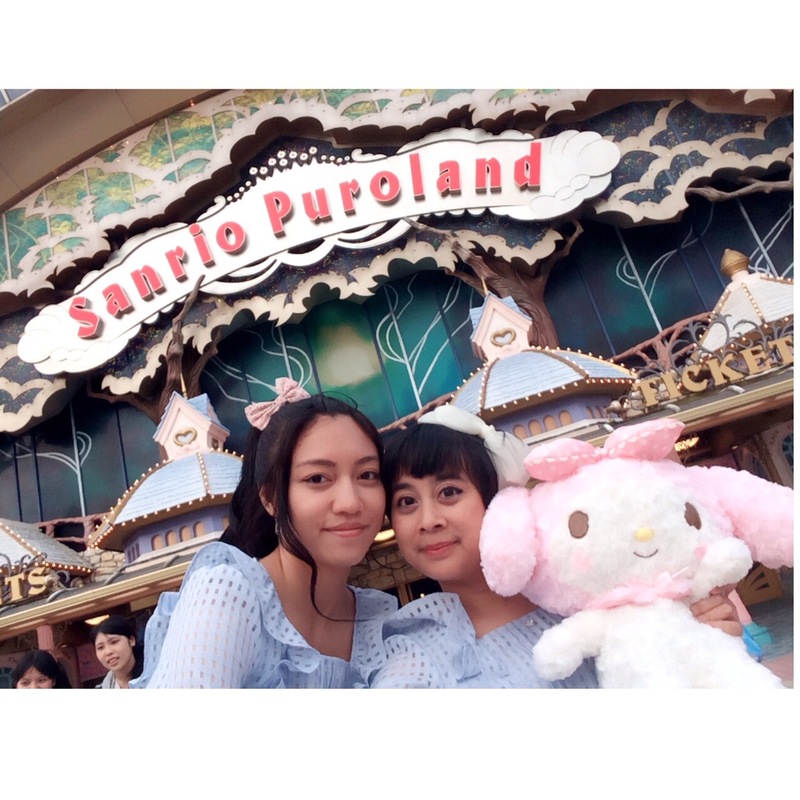 So yesterday I went to Sanrio Puroland with my bestfriend Hilda. 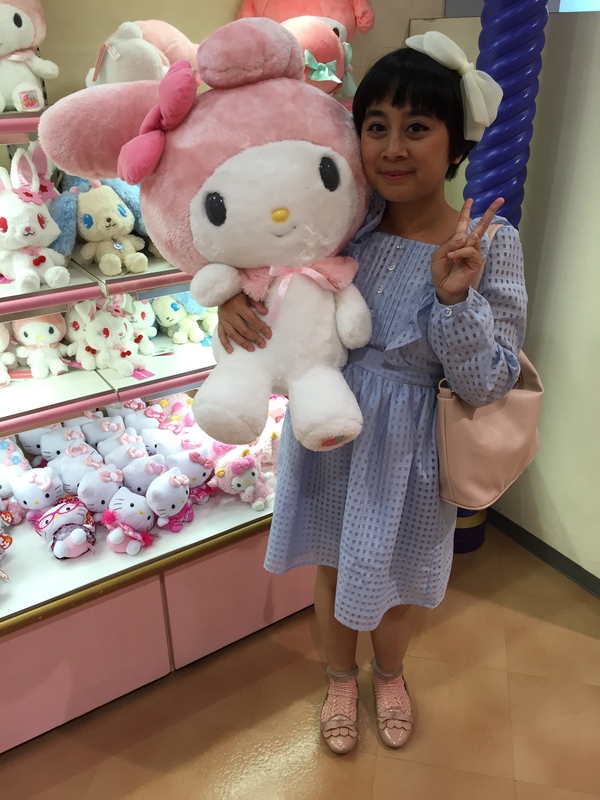 And since we are sort-of a Sanrio-addict we were really-really excited! We even managed time to get the same dress for this particular occasion. Before I told you about our adventure there, let me give you a general information for this park. 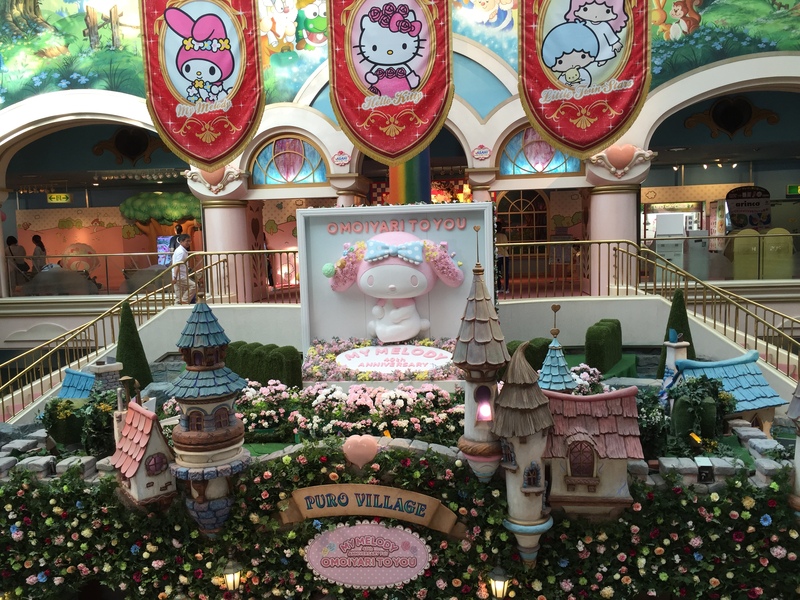 Definitely from the name it is an all Sanrio-character theme park located at Tama City, Tokyo. 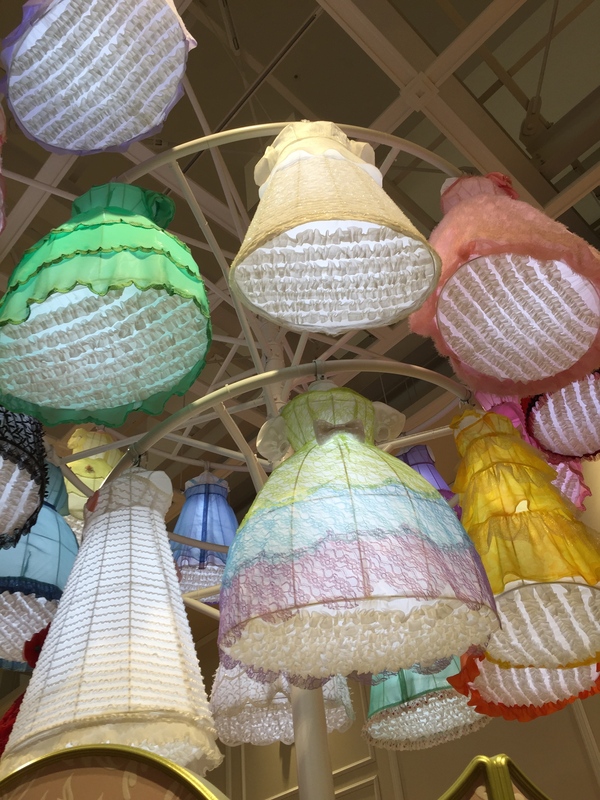 It is located just a short walk from the South Exit of Odakyu Tama Center Station (Odakyu-Tama Line). 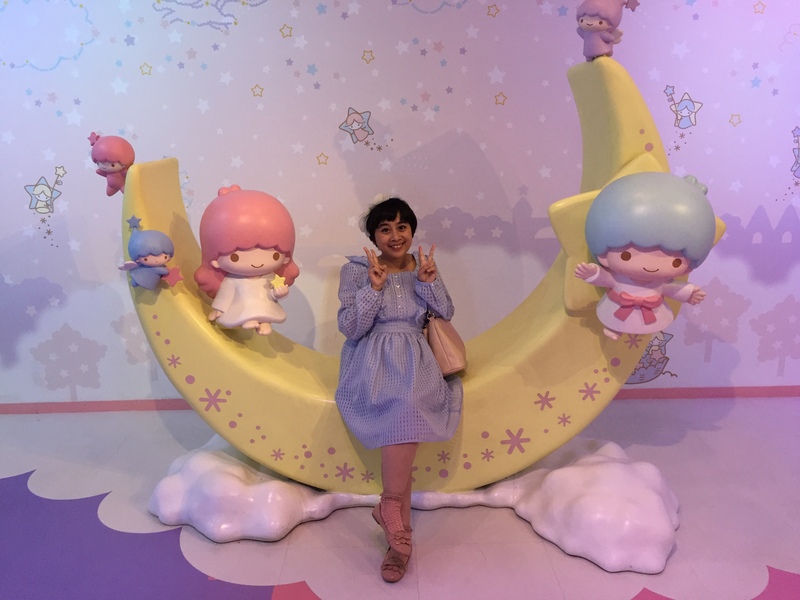 You can basically meet any Sanrio character there from the famous Hello Kitty, My Melody, and Little Twin Stars, to the little known ones like Monkichi (or it’s just me that don’t know Monkichi?). 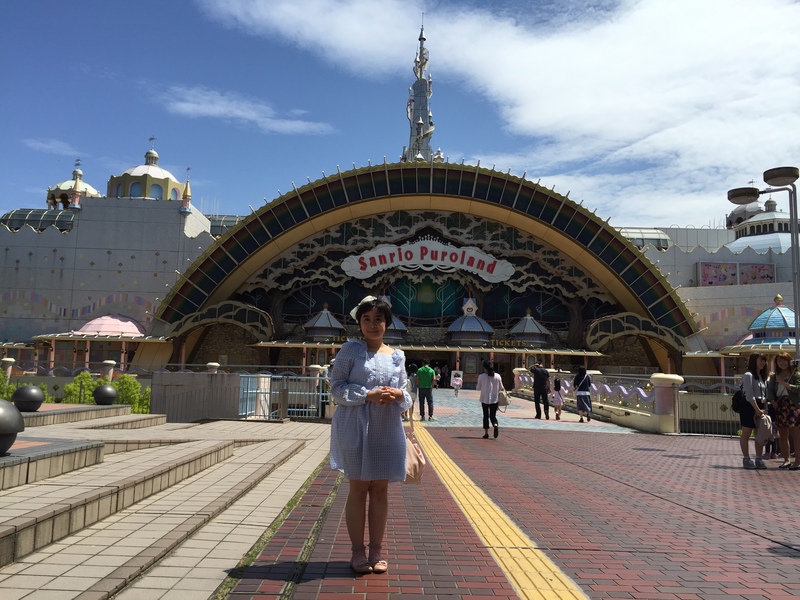 In my opinion this park is really popular for Japanese (but we spotted some foreigner, though) and popular for toddlers and children (though we also spotted other grown up women, mainly come in pair with twin dress, just like me and Hilda). 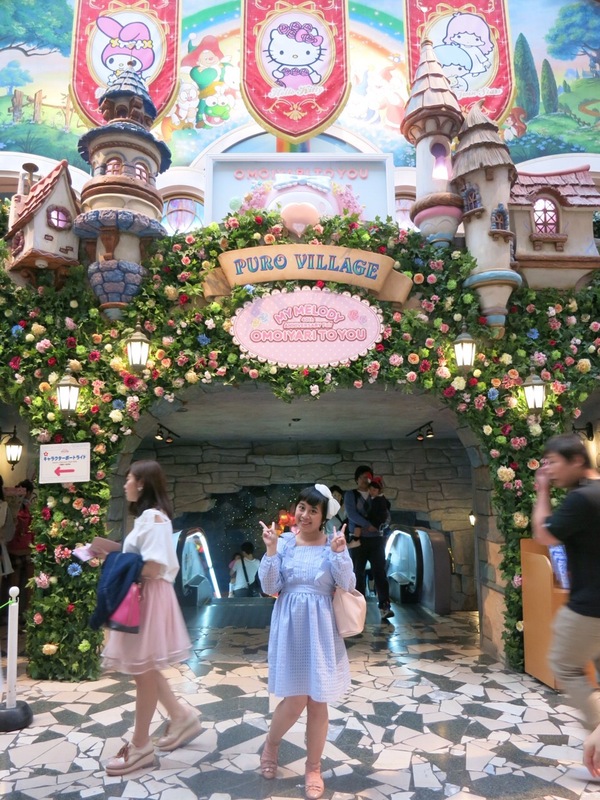 It was Golden Week so the park was kinda fully packed with people, but it’s indoor and the queuing is nothing like Disneyland, so don’t worry! What’s the main event currently held there? 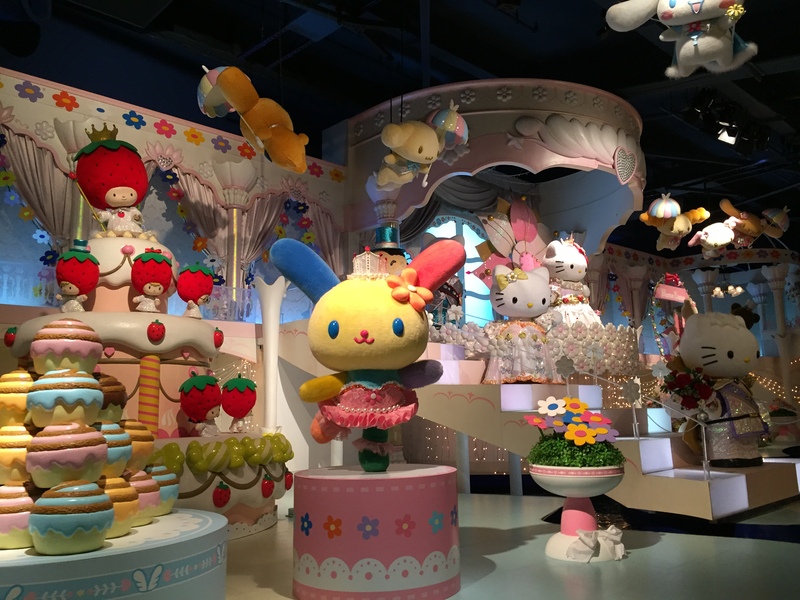 When we came, Sanrio Puroland also celebrates My Melody 40th Anniversary (geez, she’s that old). 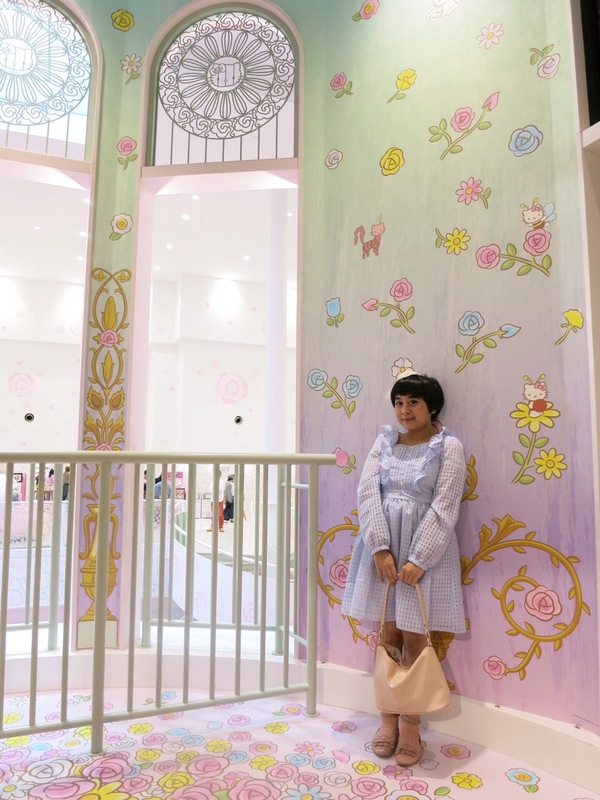 So they made special shop for her and the theme is just all for her! 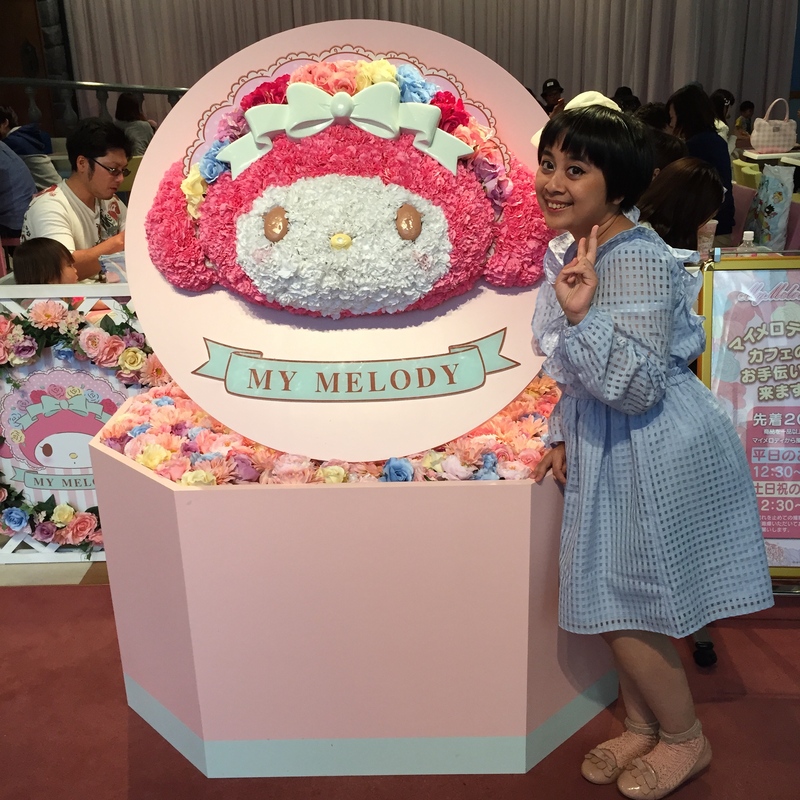 Good for me as a huge Melody fans! 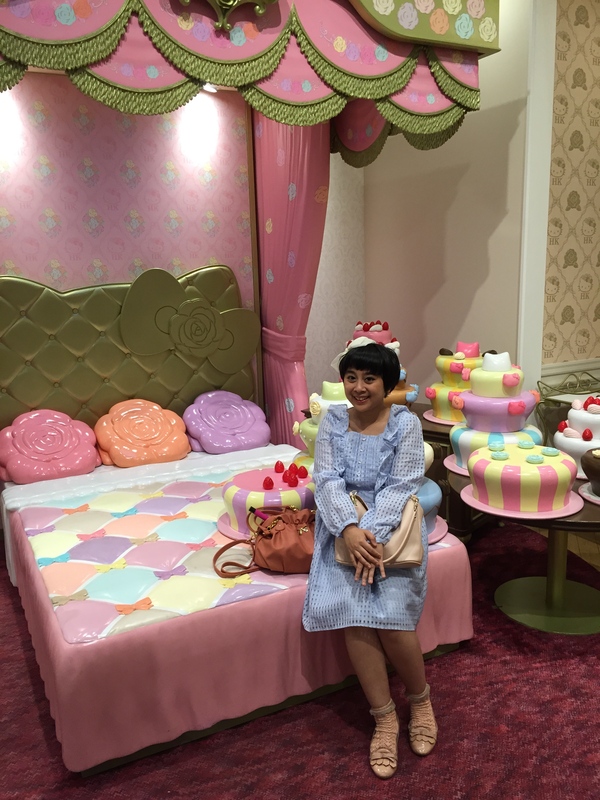 What’s the main attraction there in Sanrio Puroland? 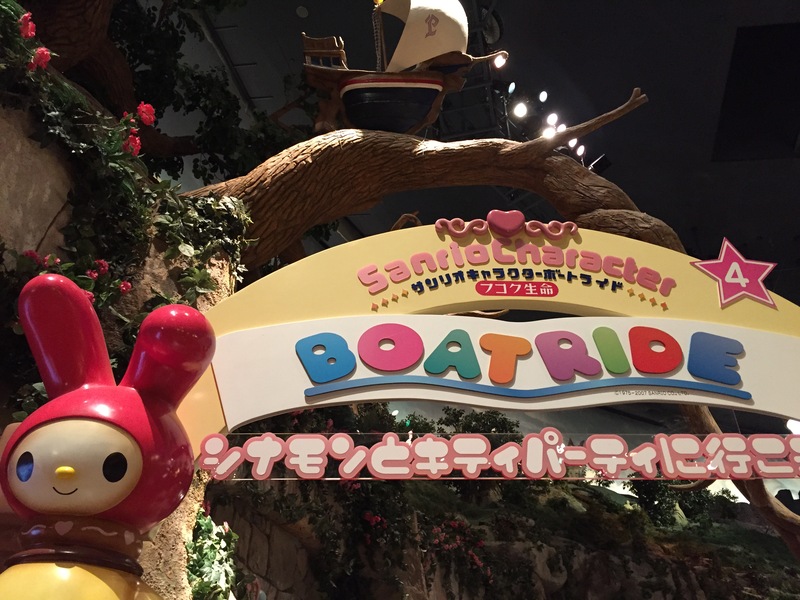 The boat ride is the first thing you will see at the entrance. 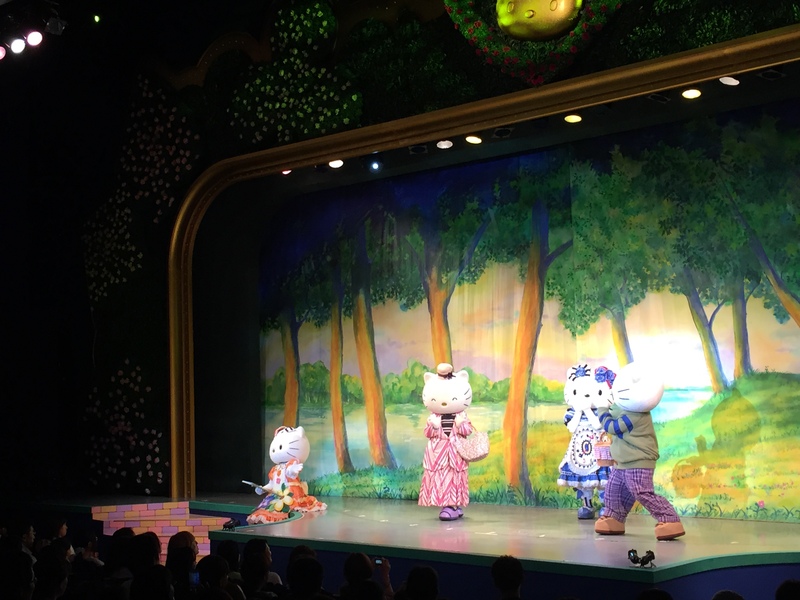 During the first half of the ride you will get an overall introduction of all Sanrio Characters. 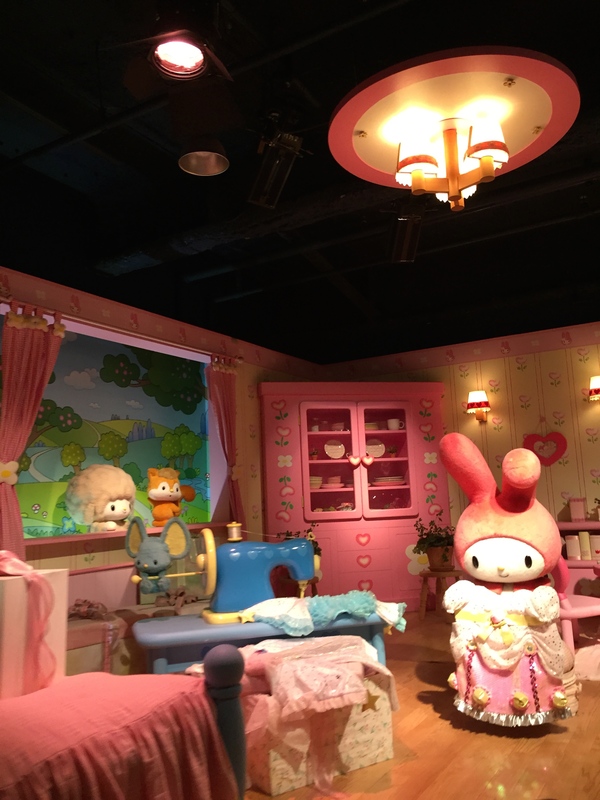 During the second half of the ride you will see them all inside Hello Kitty’s Party! 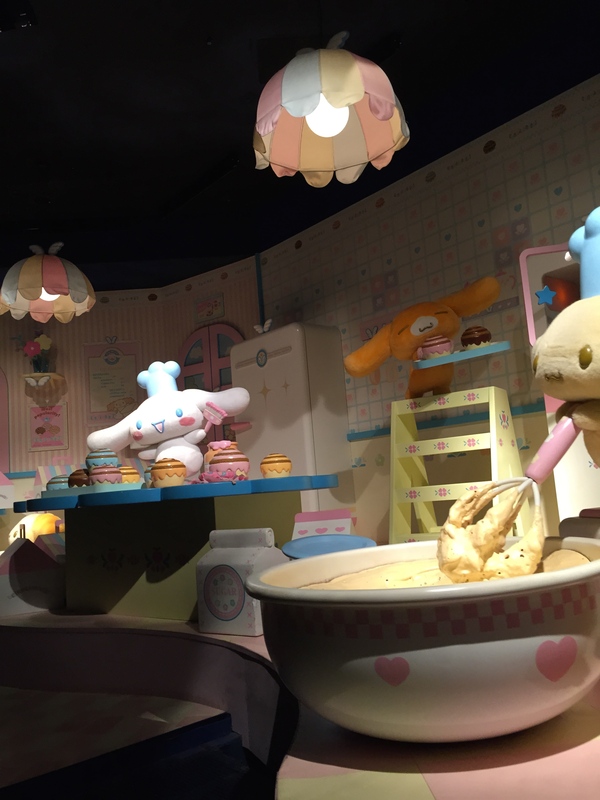 The decoration and character are so cute, you can even smell cinnamon when you see the cinnamon roll! 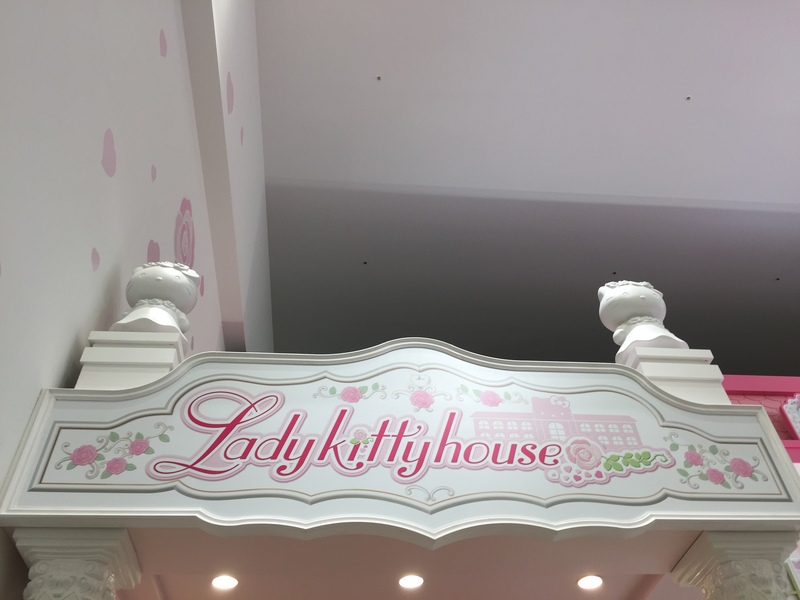 Next thing up is Lady Kitty House. 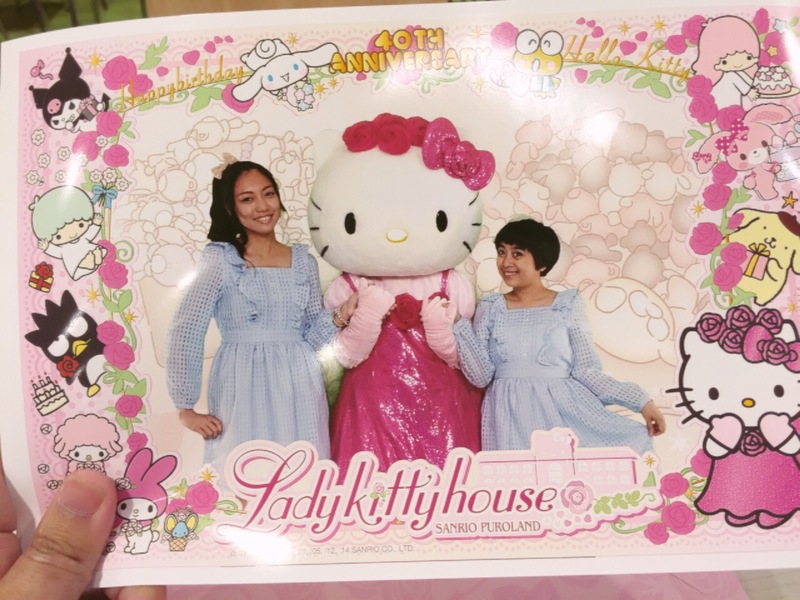 But please note that Lady Kitty is not Hello Kitty (Kitty White), Lady Kitty is actually Rose White, Hello Kitty’s Grandmother. How can you see the difference? Rose White wears rose instead of red ribbon! But the house itself is super cute and magnificent! 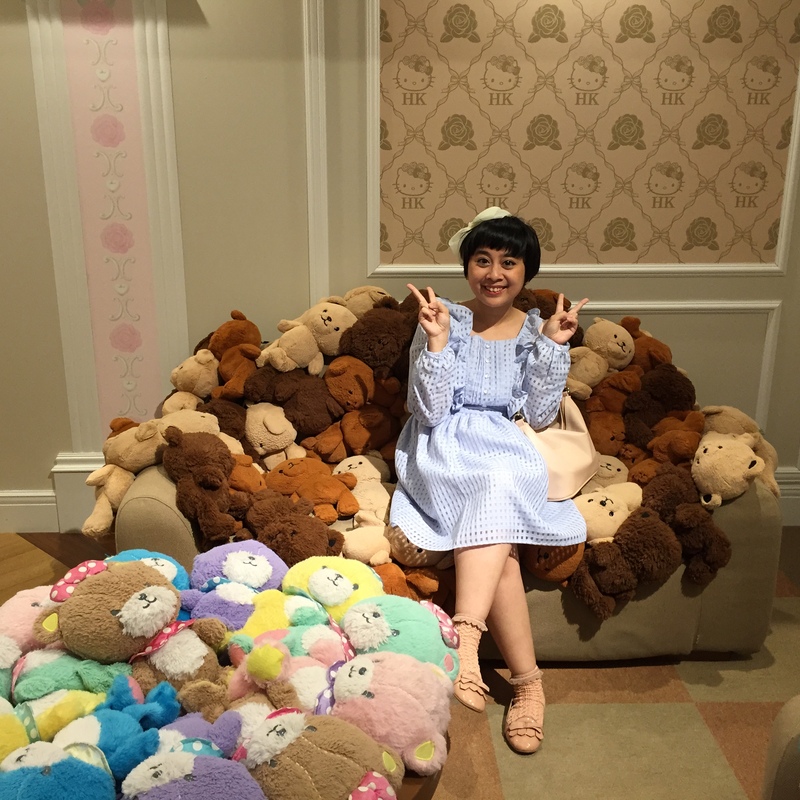 You can go inside the house, look around all the cute stuffs, take picture, and in the end take picture with Lady Kitty :3 (but you will have to pay 1600 Yen more to get your photo printed). 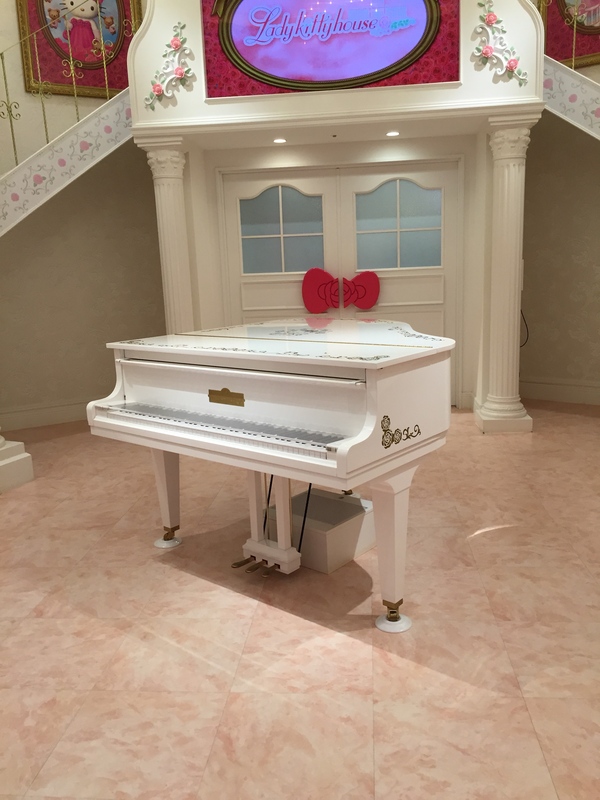 You will be greeted by Lady Kitty’s baby grand piano upon arrival and after that you can see Lady Kitty’s huge teddybear, her make-up, her dress collection, her bed, and everything! It’s definitely a perfect place to take pictures! 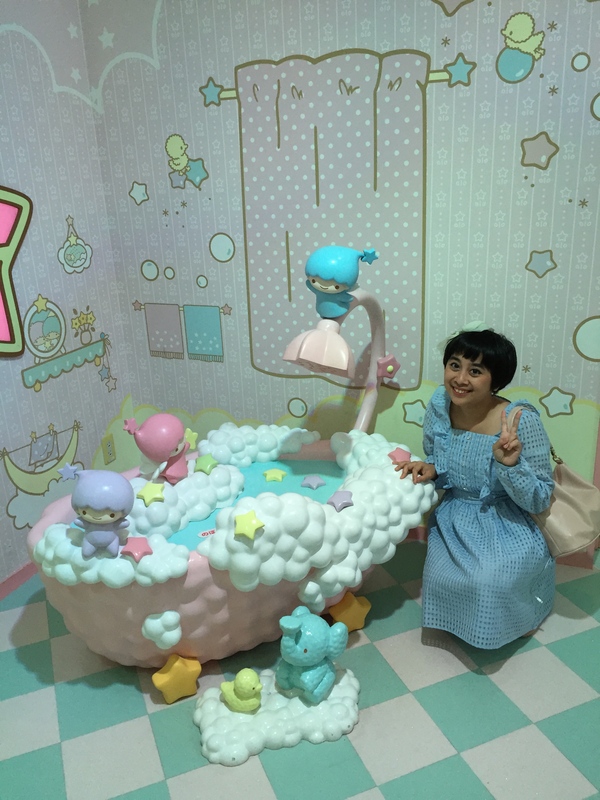 This adorable twin is also my favorite and they also have attraction related to Kiki and Lala! 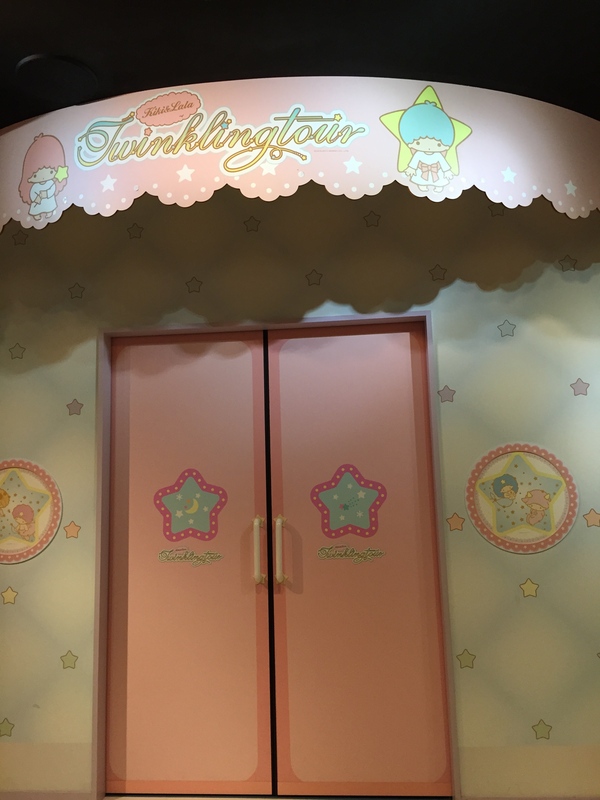 Inside the Twinkling Tour you will watched a video about their born and also why did they descend to earth 😀 You will also learn about Kiki and Lala’s magical power and about a cloud machine that can grant anything that you wish for! 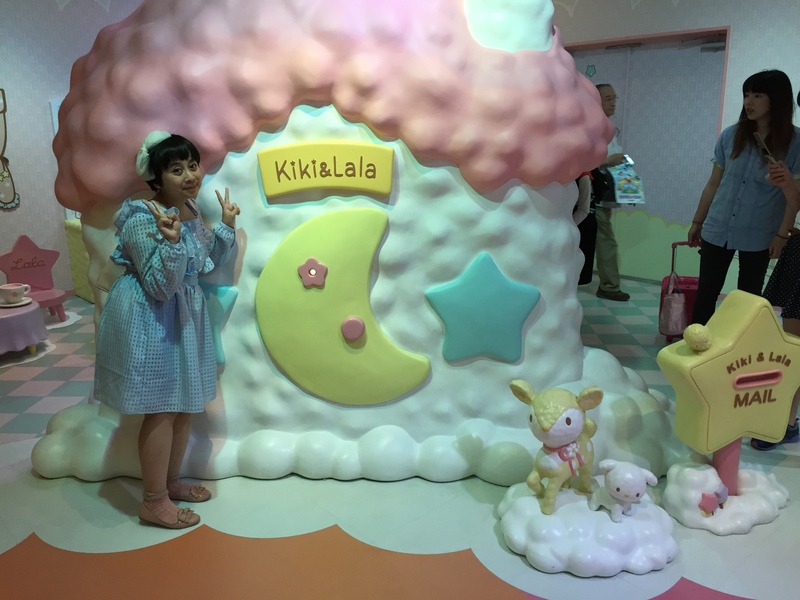 After we’ve finished watching the video, we will walk inside Kiki and Lala’s cloud house, it’s very cute! 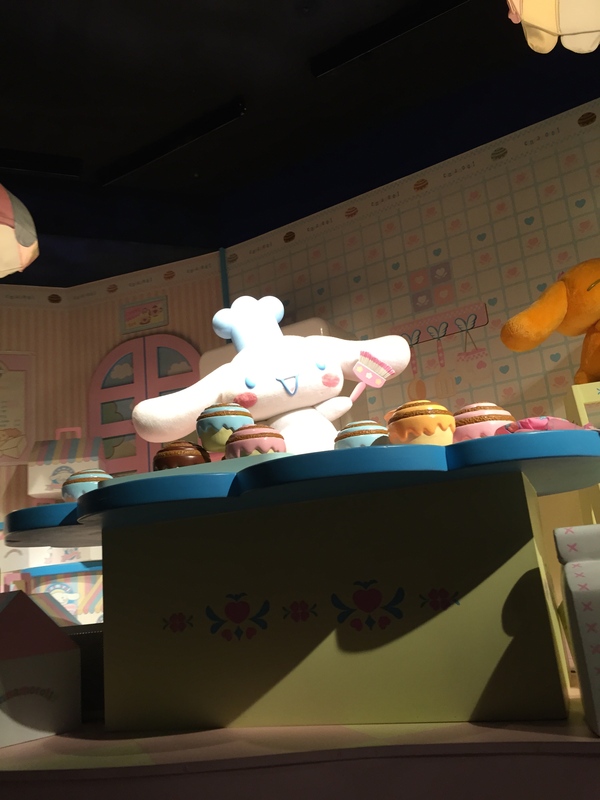 My Meroad Drive is another attraction hosted by My Melody and Kuromi. 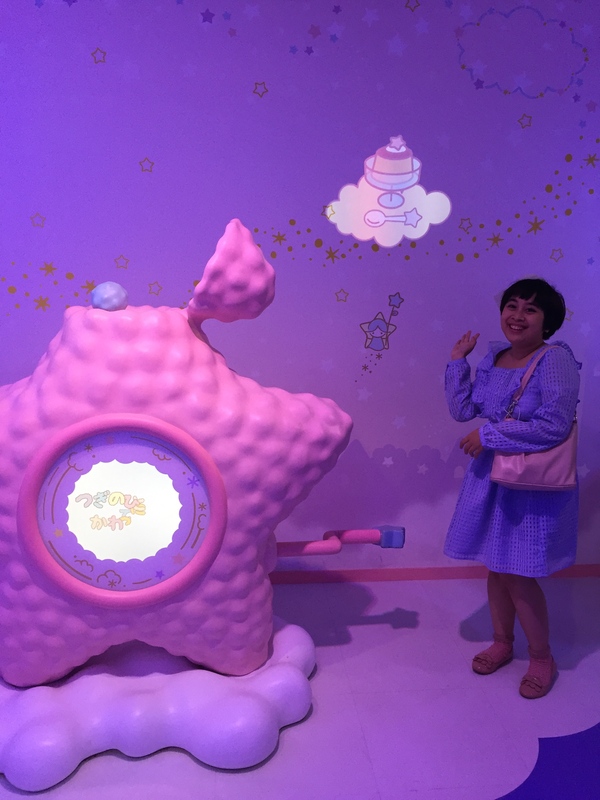 You can ride a very cute melody vehicle and the attraction mainly tell you about My Melody’s birth. The ride itself is only about 3 minutes but we have to wait for 1 hour for that, however, it is still worth it. 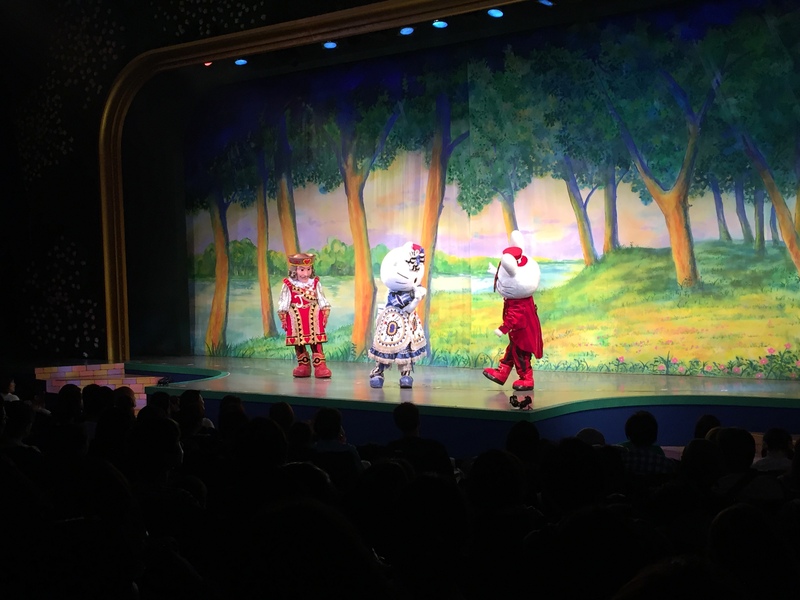 Any Musical, Parade or Character Greeting? Yes, they are. But we did miss the parade and character greeting, though. 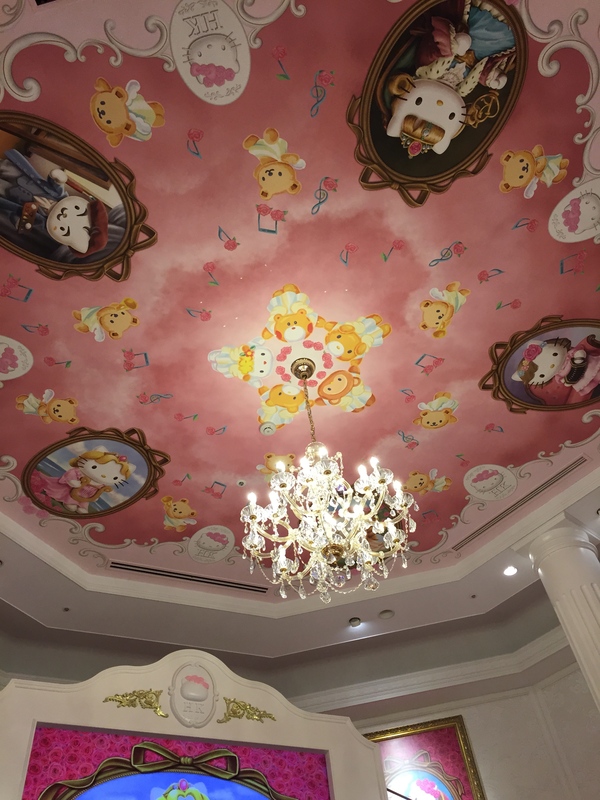 Due to golden week, they did not have character greeting for main character (Hello Kitty, Melody, etc.) but only for some minor unknown character. 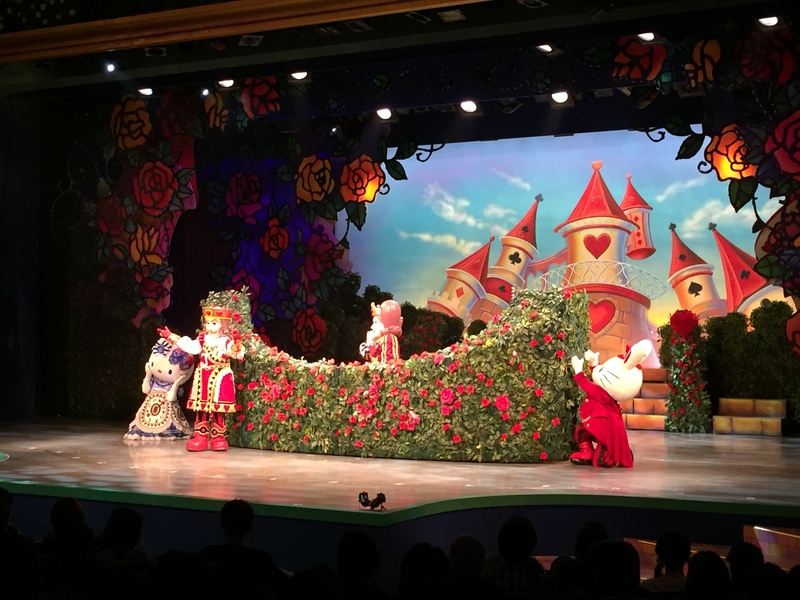 But the musical, Hello Kitty in Wonderland is really excellent! 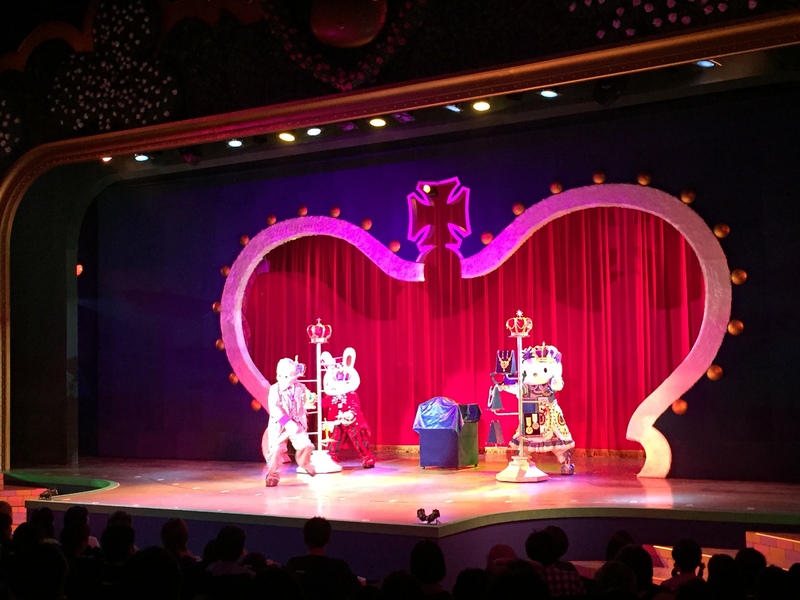 Kitty is helping Kyle to search for Heart Queen’s lost heart (which was stolen by Joker, but Jack was the culprit). How about the shopping experience? 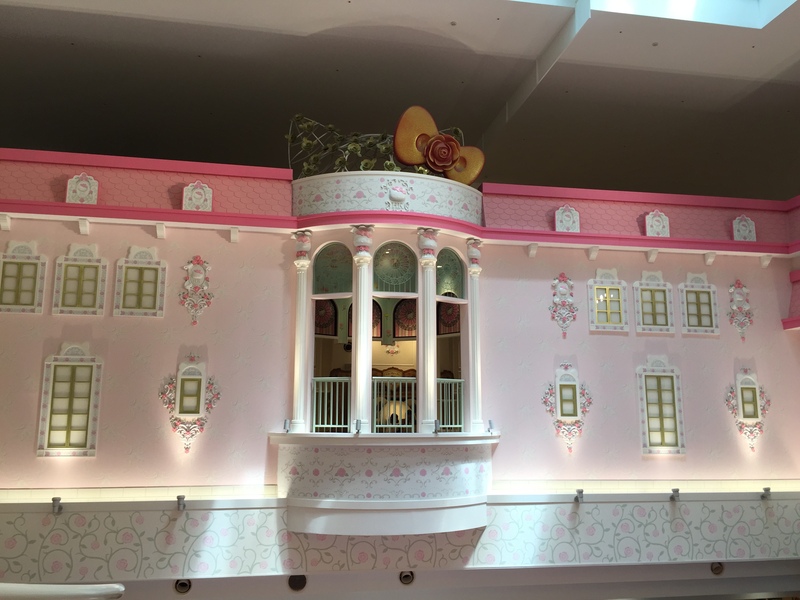 It is definitely a shopping paradise for Sanrio lover! 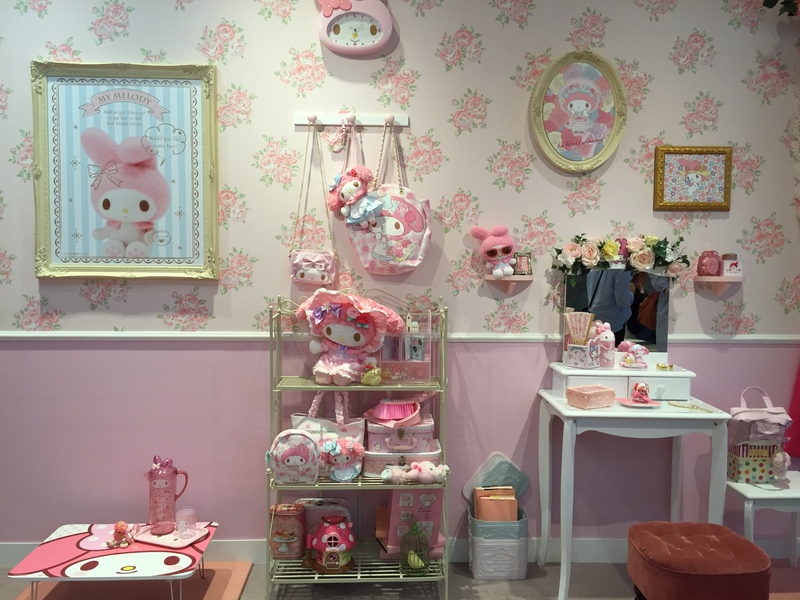 :3 They have so many stores, like store special for Hello Kitty, My Melody, and Little Twin Stars. But we explored the biggest one located near the main entrance, it had the combination of all characters! 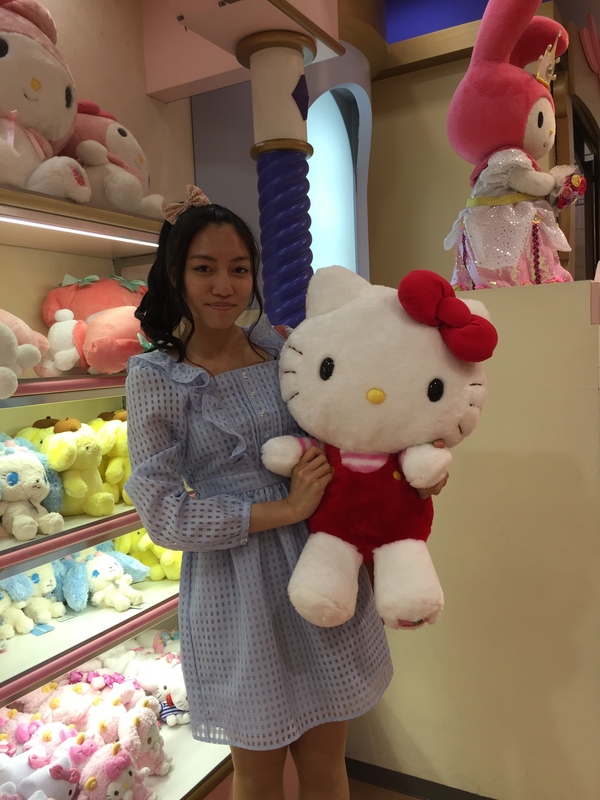 They basically sold everything related to Sanrio. 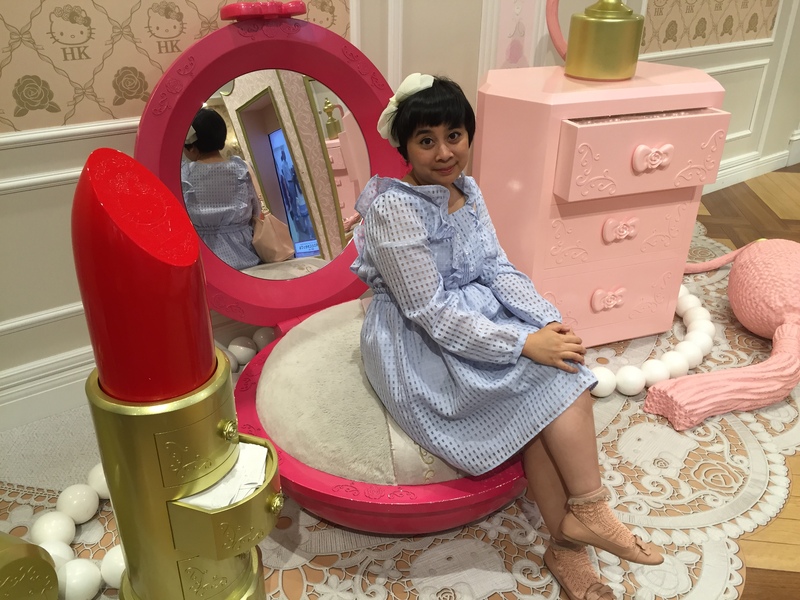 From common things like doll, accessories, until shoes, bag, and even trunk! 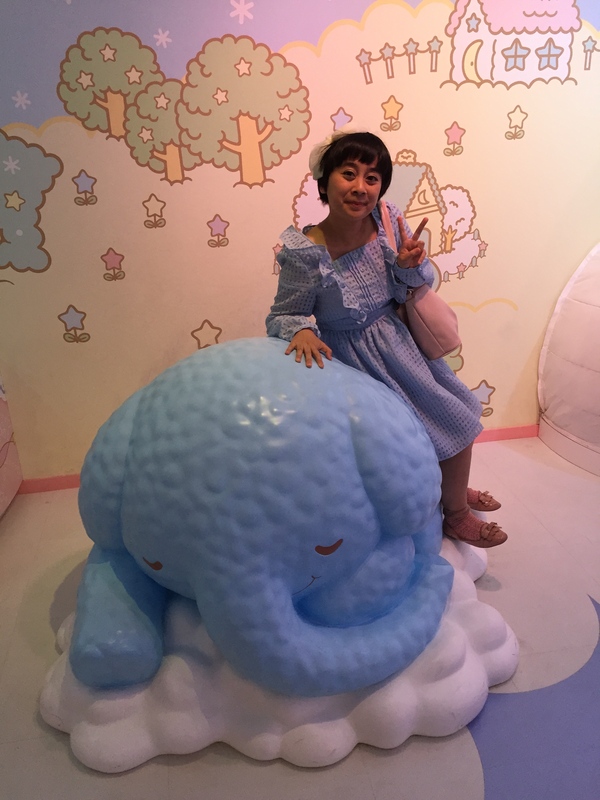 I rated it 10 out of 10 (because i’m a Sanrio maniac, lol) 😀 I really want to come again later when it’s not Golden week, so we can get more photos with the main character! It has been so long since my last post! 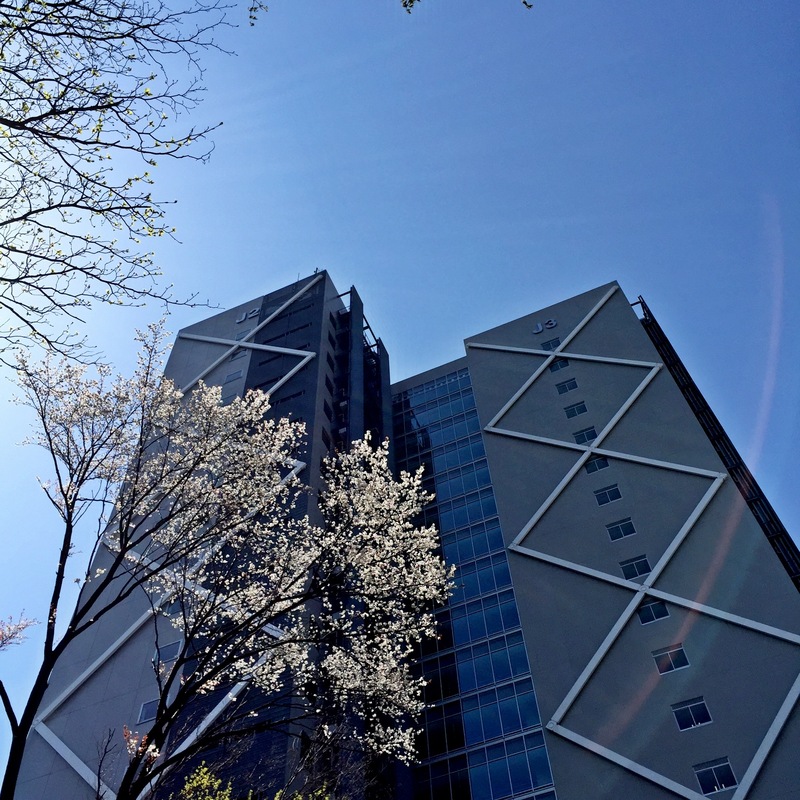 Now it’s already April and Sakura season has almost ended here in Tokyo, Yokohama and its surrounding. 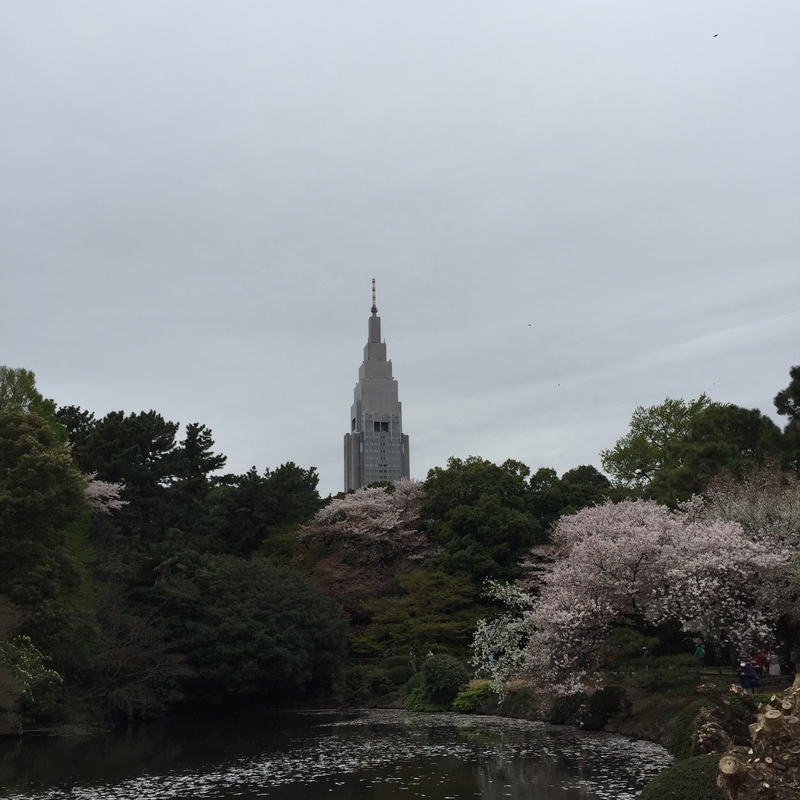 Since i came back to Japan from my spring holiday in the right timing, this year I could enjoy the beauty of Sakura in Tokyo! 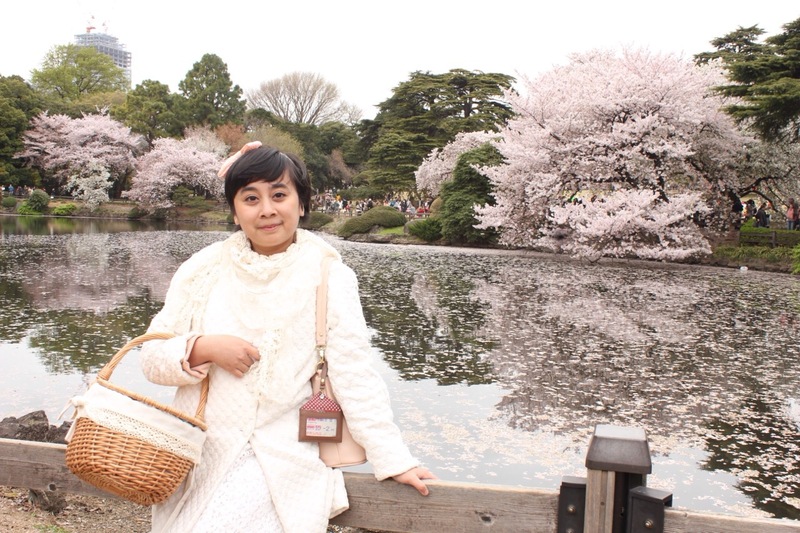 So, let me share you my story about this year Hanami (Japanese tradition of flower viewing experience! 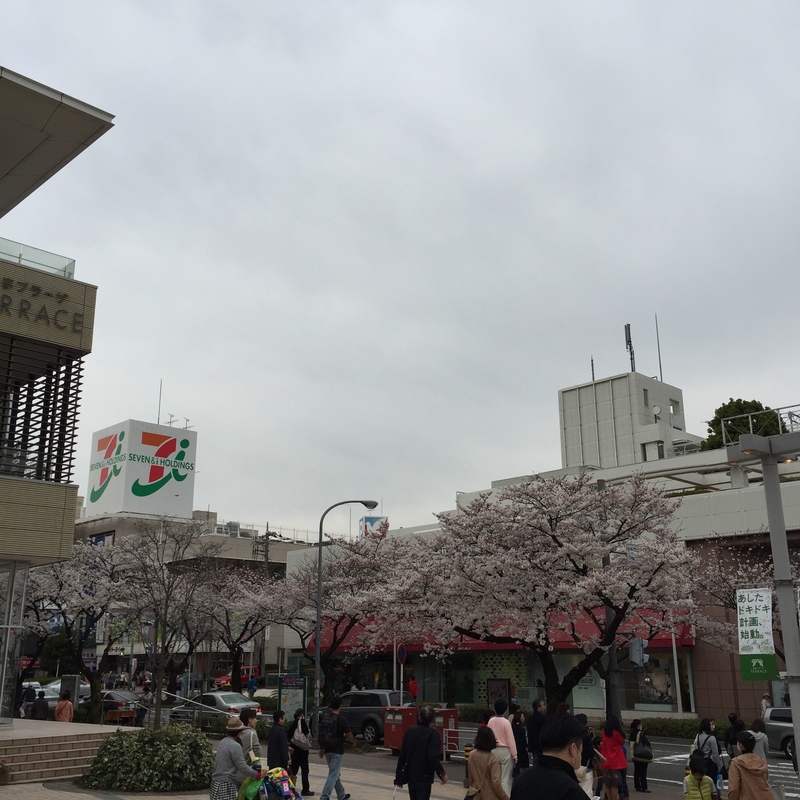 I went there when the Sakura had not bloomed 100% yet but the place was already quite full. 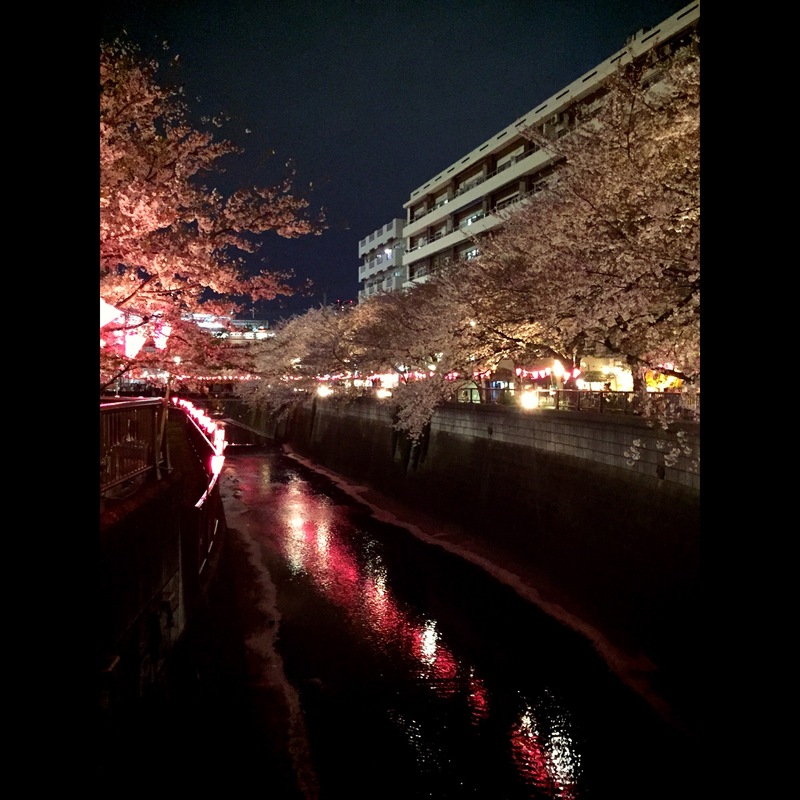 So please expect it to be really crowded during Sakura full bloom. P.S : try the Sakura Cake from Starbucks located nearby, it’s so delicious! 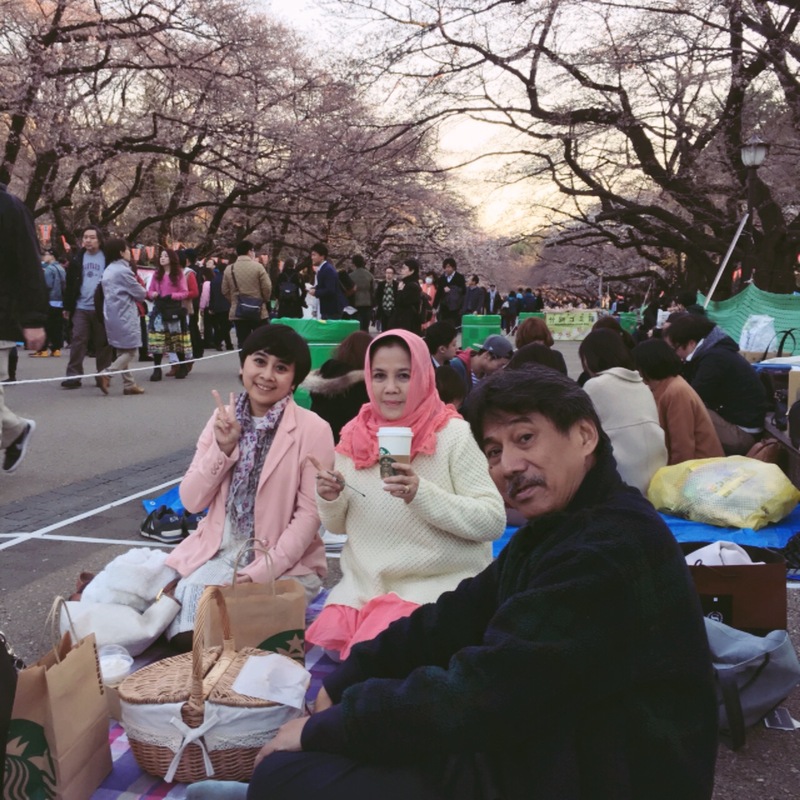 One of the most popular hanami spot in Tokyo due to its vast lawn, selections of park, and selections of beautiful sakura trees. Beware! The park is very huge! 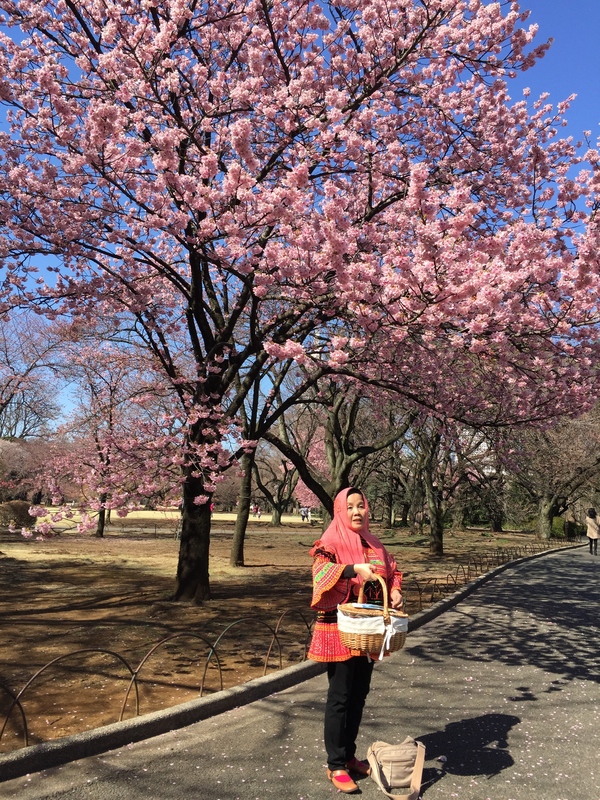 Do take the map and take a look carefully on where the sakura trees are located. 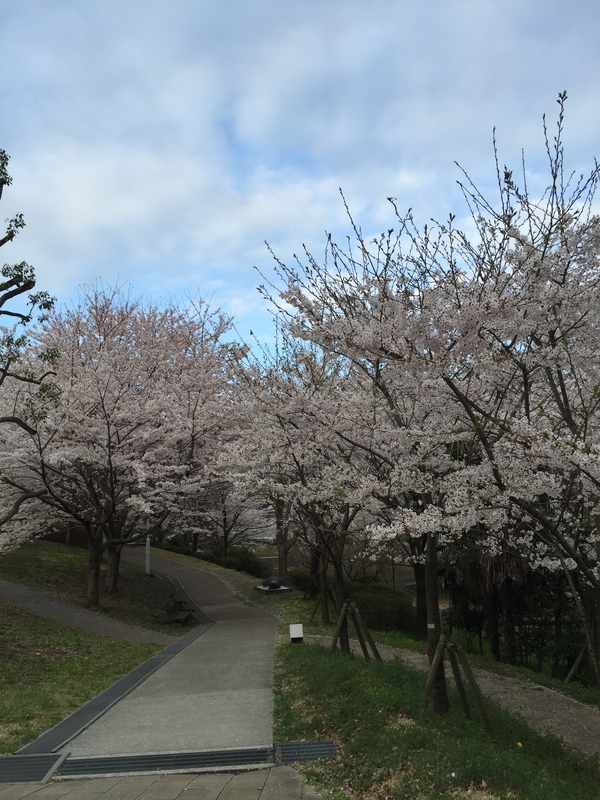 Generally sakura trees are clustered around English Landscape Garden (nearer to Okido Gate). 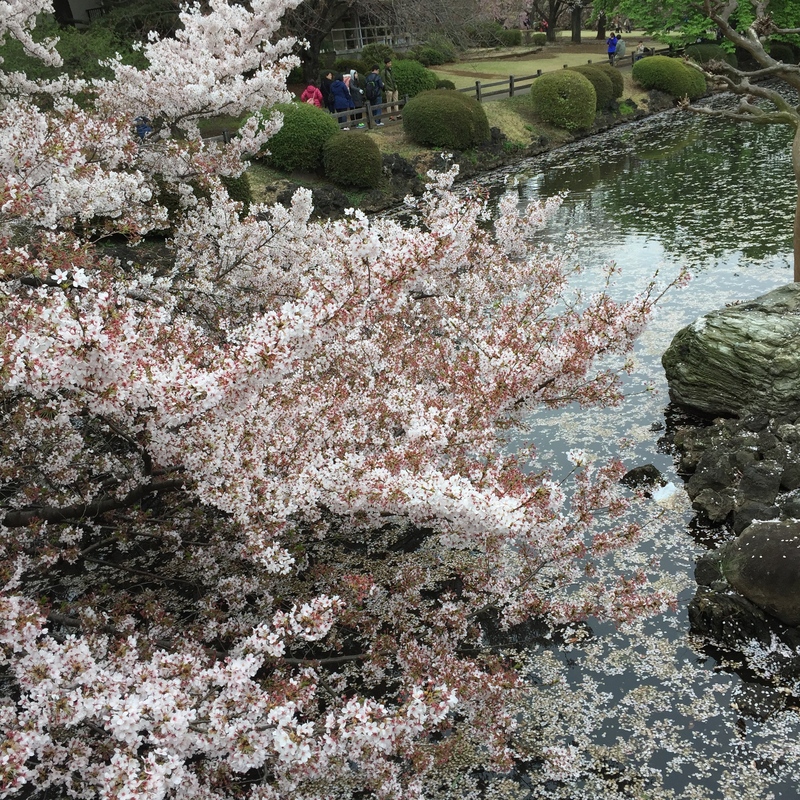 There are also some individual trees located in French Formal Garden and Japanese Traditional Garden. 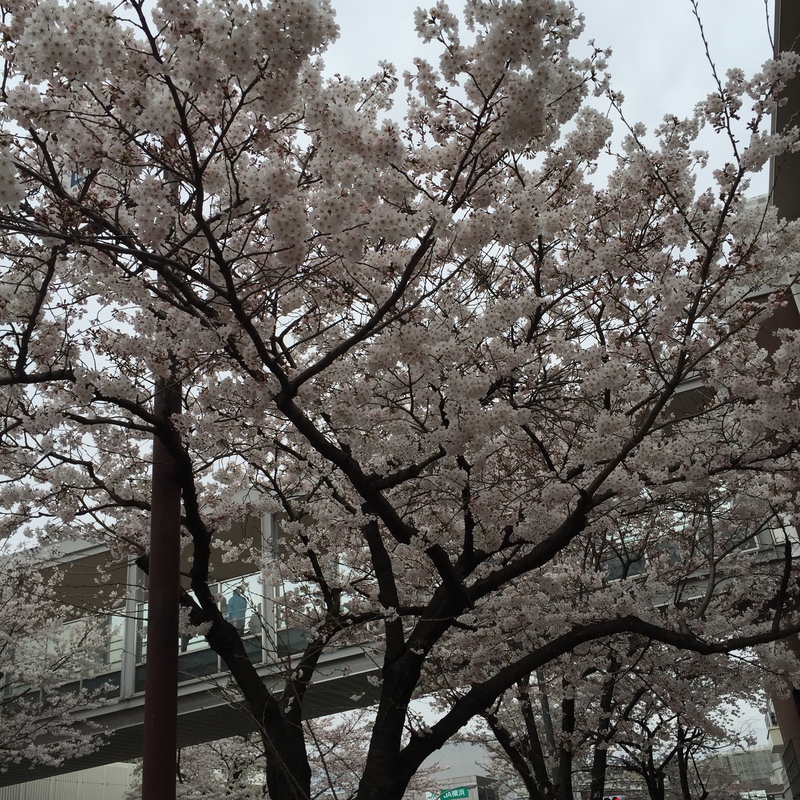 There is a street lined with sakura trees just outside Tama Plaza Station and it’s quite beautiful. 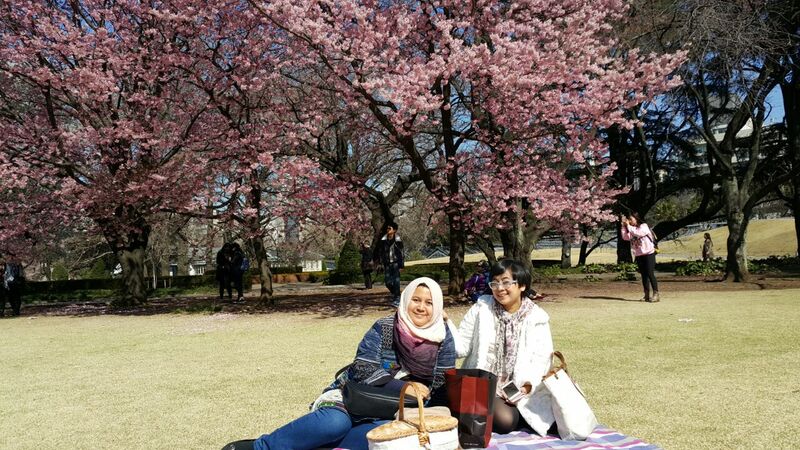 Campus is (surprisingly) lined with beautiful sakura trees! 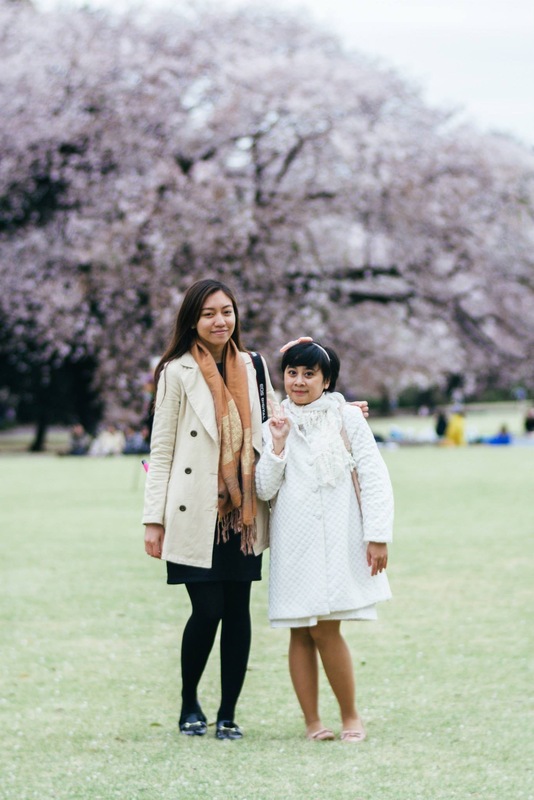 The sakura trees are just everywhere! It lined up beautifully on the main intersection, it grew also in the canteen area (and there were dozens of it), and also it scattered in some other spot, like near J1 Building. forming a sakura-forest pathway behind our canteen! 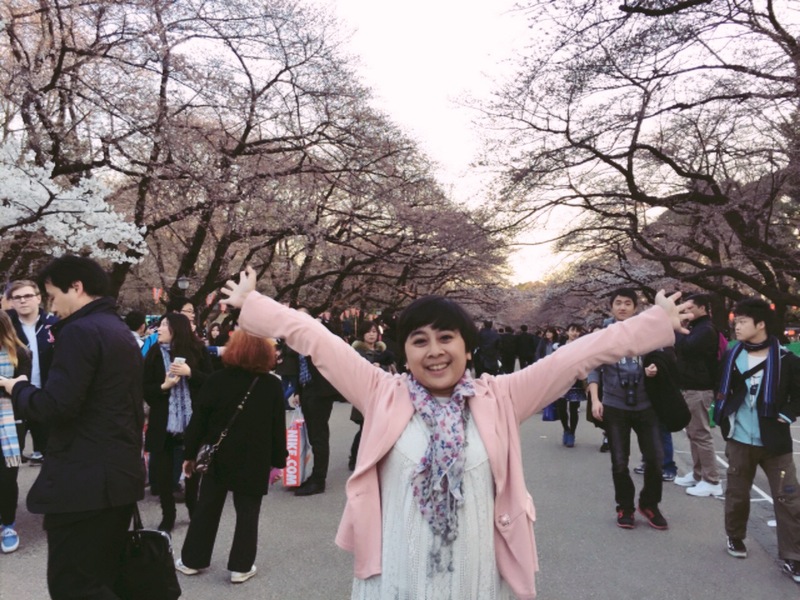 I went to the Suzukakedai PPI Tokodai Mini Hanami, it was fun to eat just under the sakura trees! 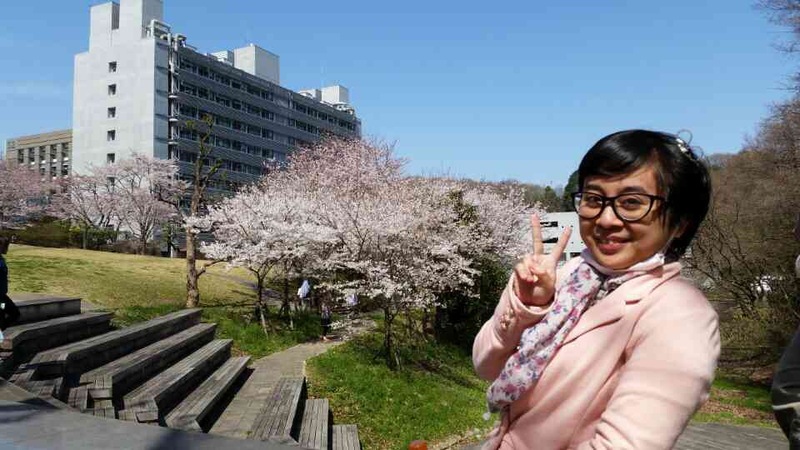 Selfie under the sakura tree! 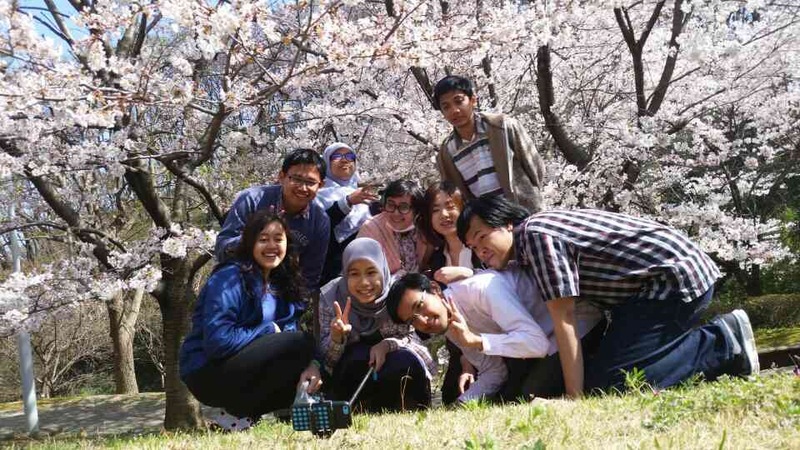 I visited Shinjuku Gyoen once more and this time with PPI Tokodai (Tokyo Tech Indonesian Student Association). 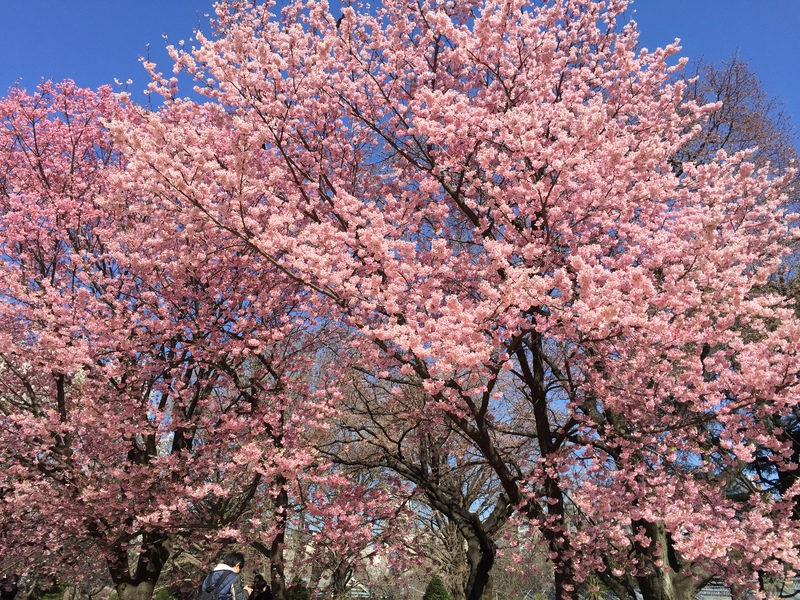 At this time, it was the first weekend after the full bloom, so the park was packed with people! But still the park was huge, it was still spacious! 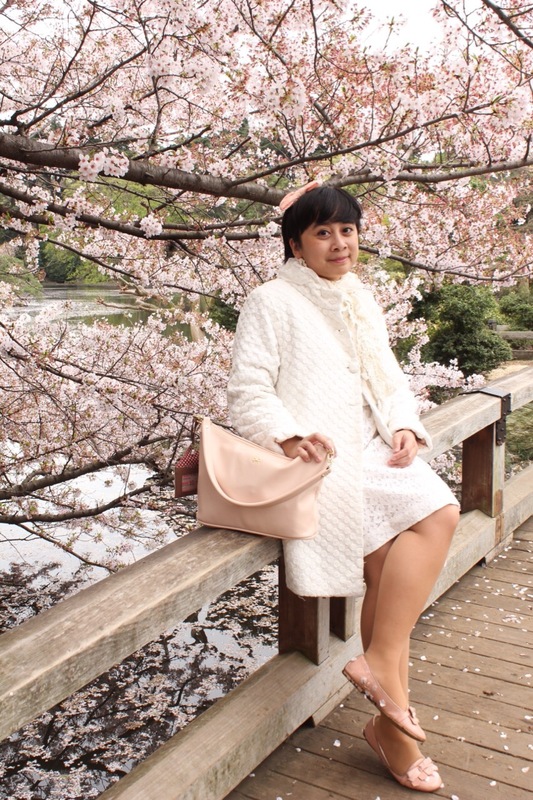 The sakura was sort of falling into the ground, creating a lush beautiful pink carpet on the grass and also on the lake! I did a little photoshoot with Hilda and explore the park more than my last time. Sakura trees falling into the lake! 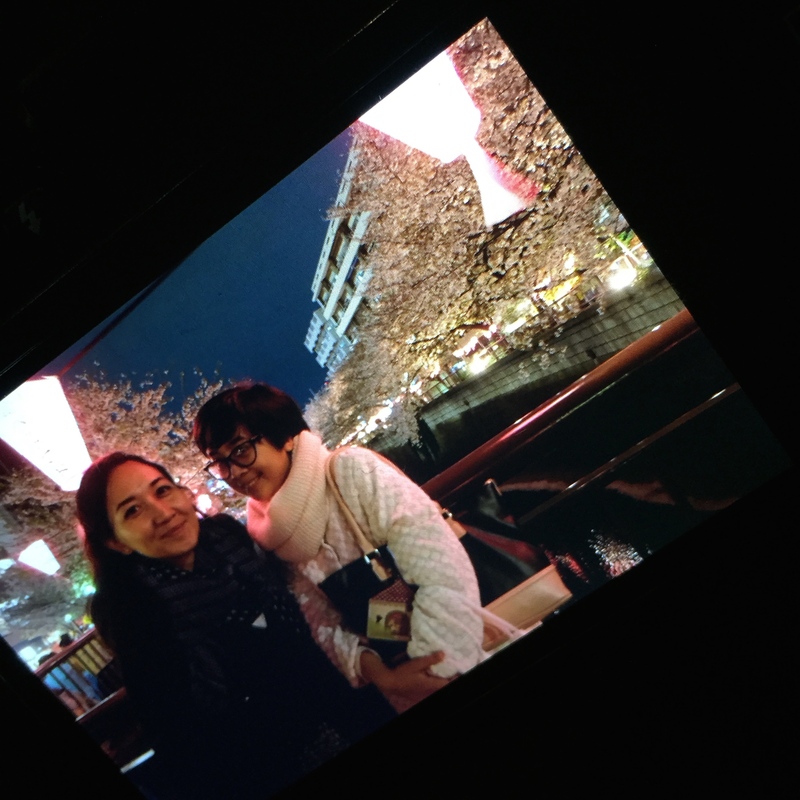 After that, we did the hanami! The activities were fun from Potluck, games and cooking competition. 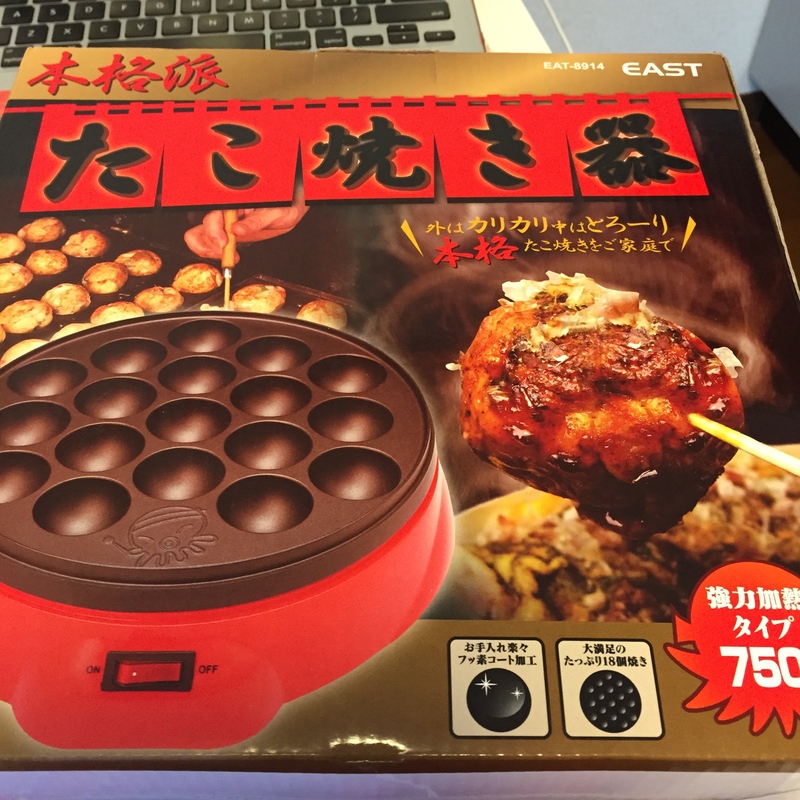 Today, i had breaded chicken cutlet and tamagoyaki with sesame-mayo dressing, i also had green salad with olive-sesame dressing I tried to join the cooking competition and got a takoyaki maker as a prize. Happy! 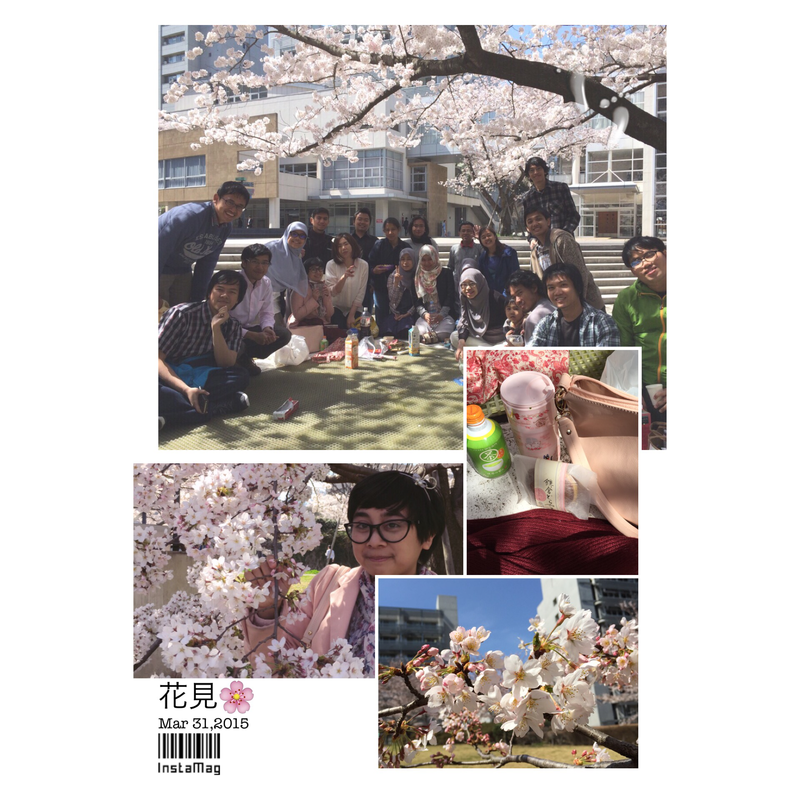 So in overall my Hanami for this year is perfect! 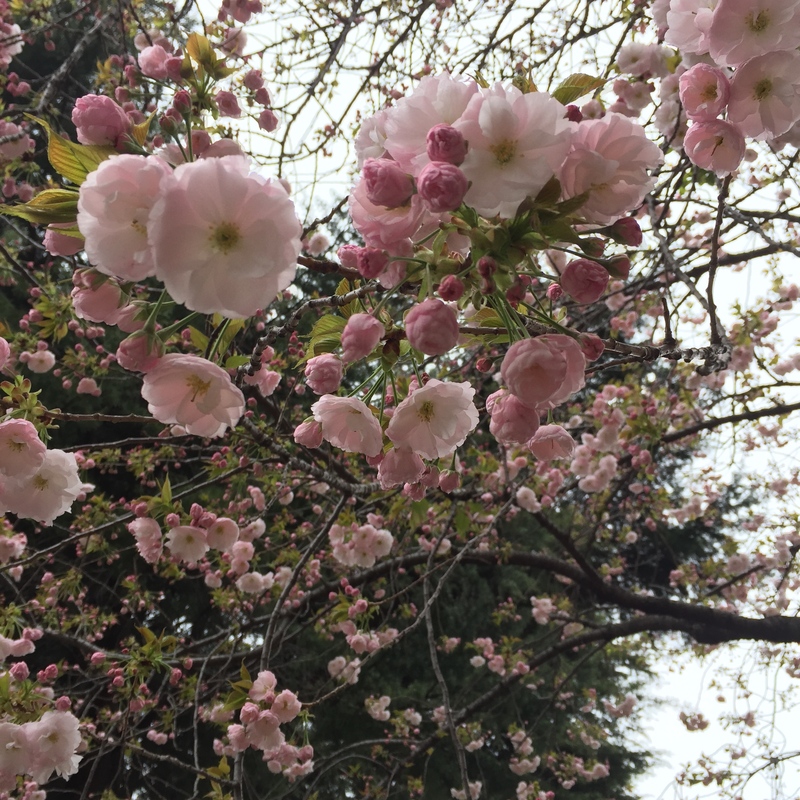 See you in next year’s Hanami, Sakura!